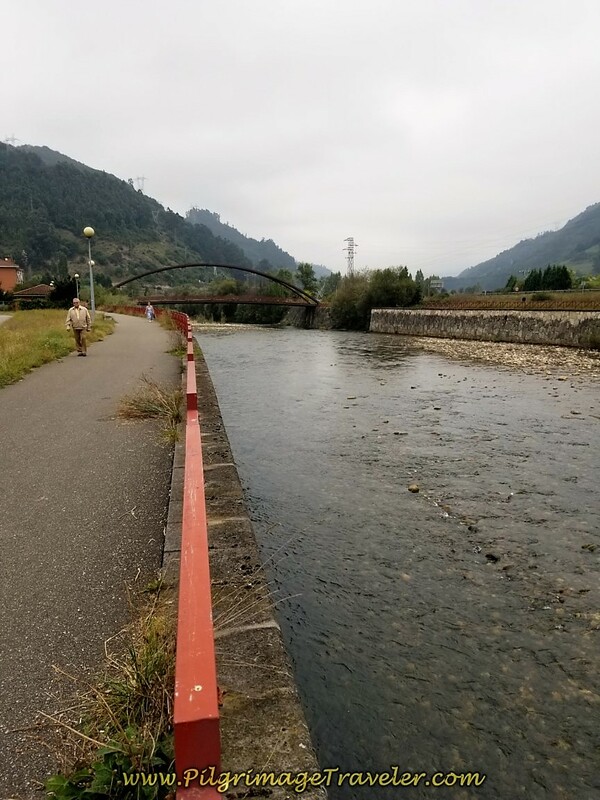 Day Five on the Camino de San Salvador is a long jaunt down two river valleys, first the Río Lena and next, the Río Caudal. 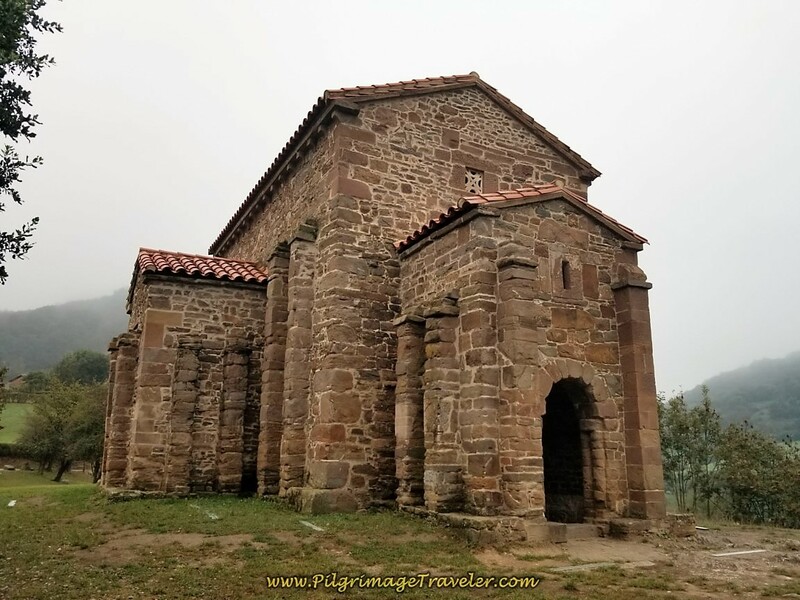 On the way, you pass many historic places, the most significant being the 9th century, UNESCO world heritage site of the Iglesia de Santa Cristina de Lena. 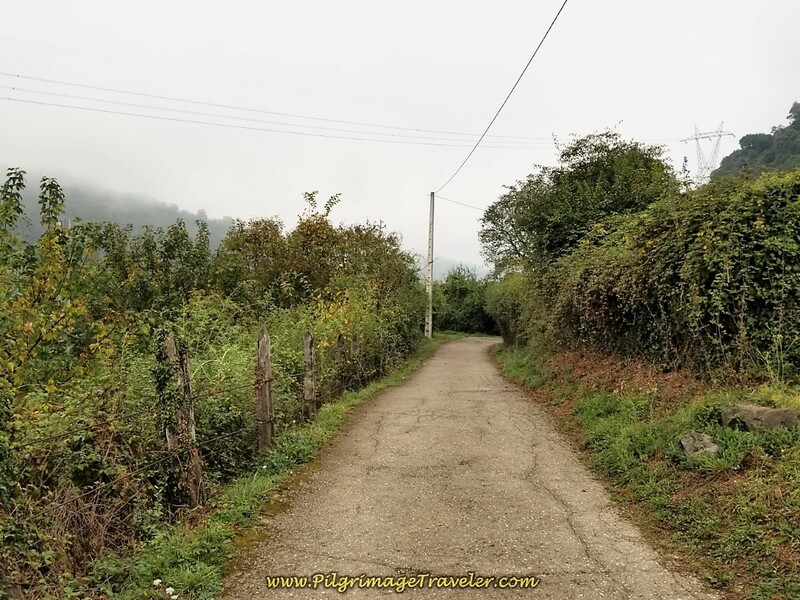 While this day was not my favorite, since it is on pavement and the Camino roads parallel the noisy A-66 highway almost the entire way, it is at least a gentle downhill stroll and not too lengthy. 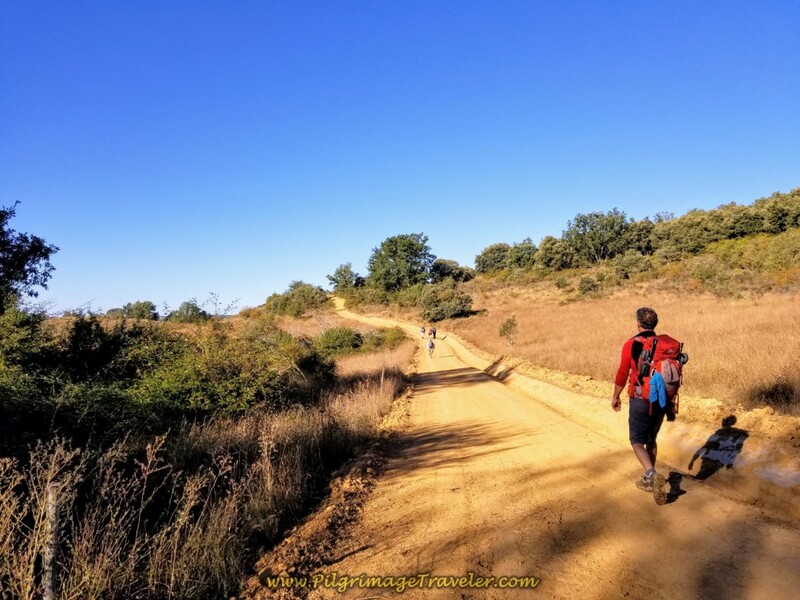 Most of us who have walked many a kilometer on the Camino de Santiago would agree with the above quote from the 19th century French novelist. A road is beautiful because it takes you somewhere, isn't that so? 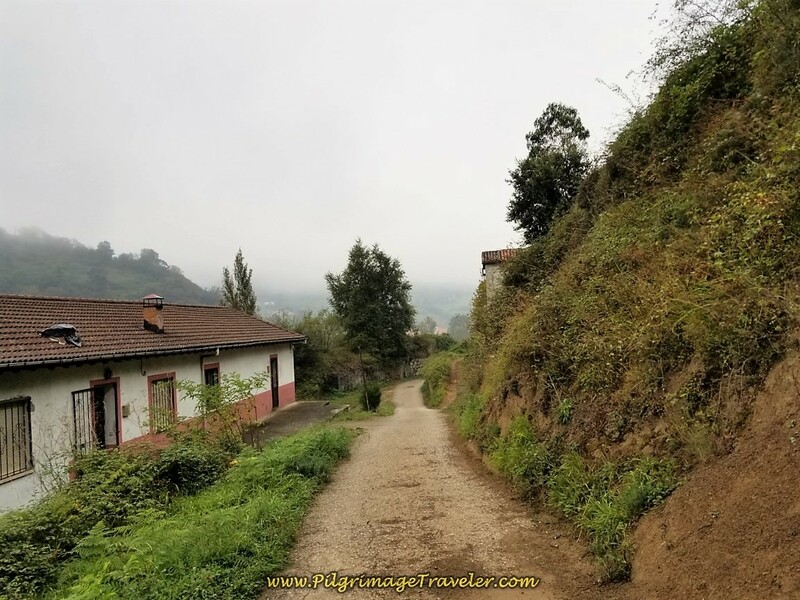 Perhaps the novelist never actually walked a long road, such as we did on day five of the Camino San Salvador, or perhaps the above quote may have been different? 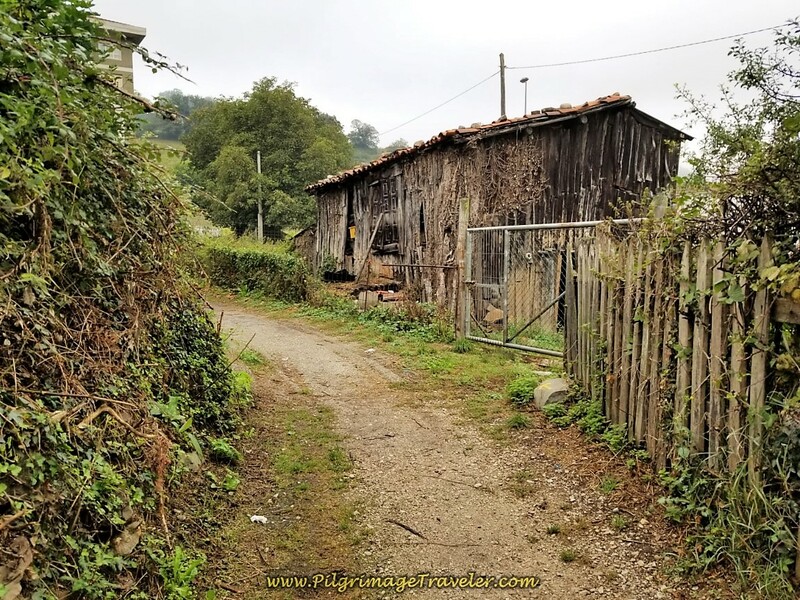 Regardless of how beautiful the road, walking a Camino certainly provides the "symbol and image of an active and varied life!" 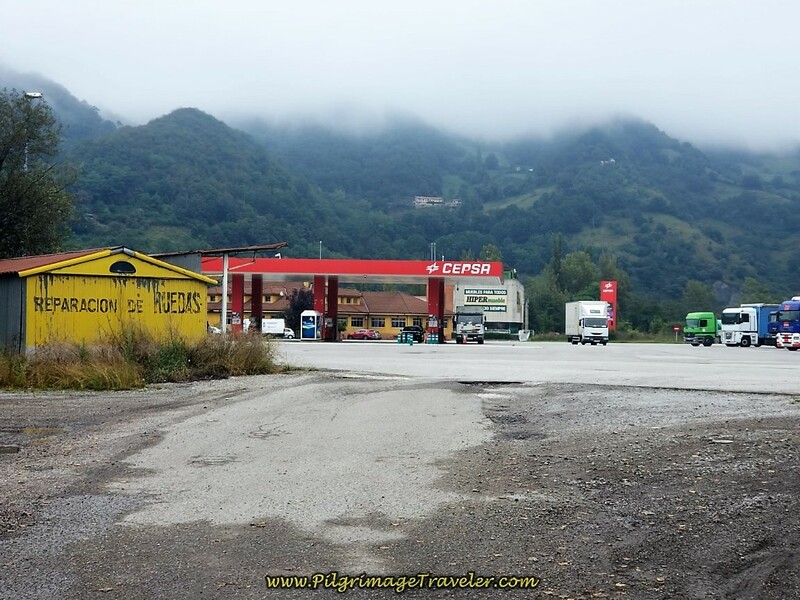 While Campomanes at the start of this day is a small town, within 7.0 kilometers of leaving it, many services abound. Here is our Google map, and you can see your varied choices, of where to stay and where to eat along the way. 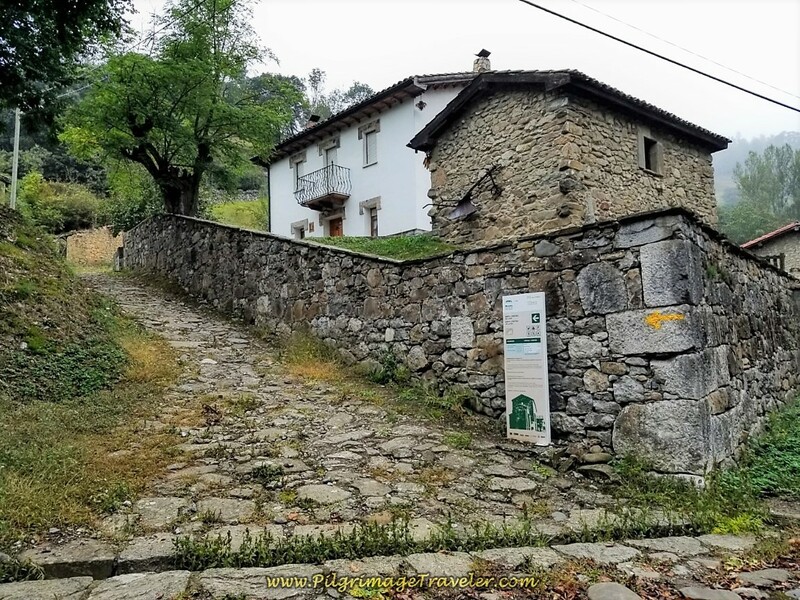 If you choose to stay in Pola de Lena, there is the Albergue de Peregrinos San Martín and many other accommodations if you prefer alternatives to the albergue. Click here to see them. 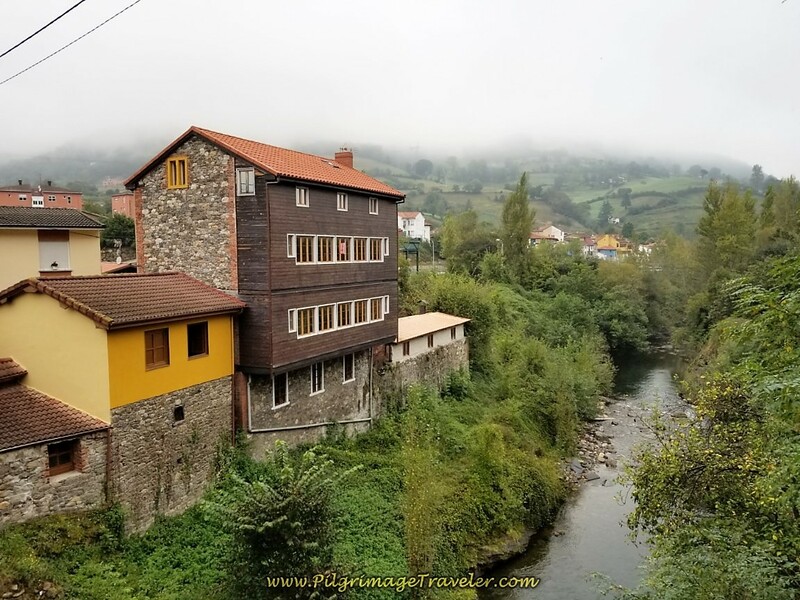 If you decide to go all the way to Mieres, the Albergue de Peregrinos de Mieres is actually several kilometers beyond the city, to the north in a small town by the name of La Peña. 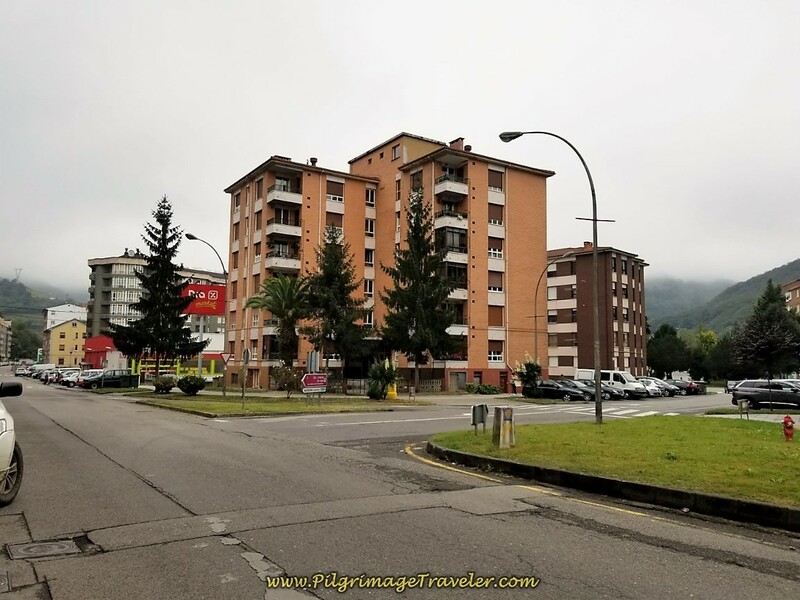 If you wish to stay within the city of Mieres, click here to see your options. The elevation profile shows one small hill climb at the beginning of the day. This is to the hilltop where the UNESCO world heritage church resides, the Santa Cristina de Lena. The rest of the day is a downhill glide, with not even a 200 meter (650 feet) change in elevation. 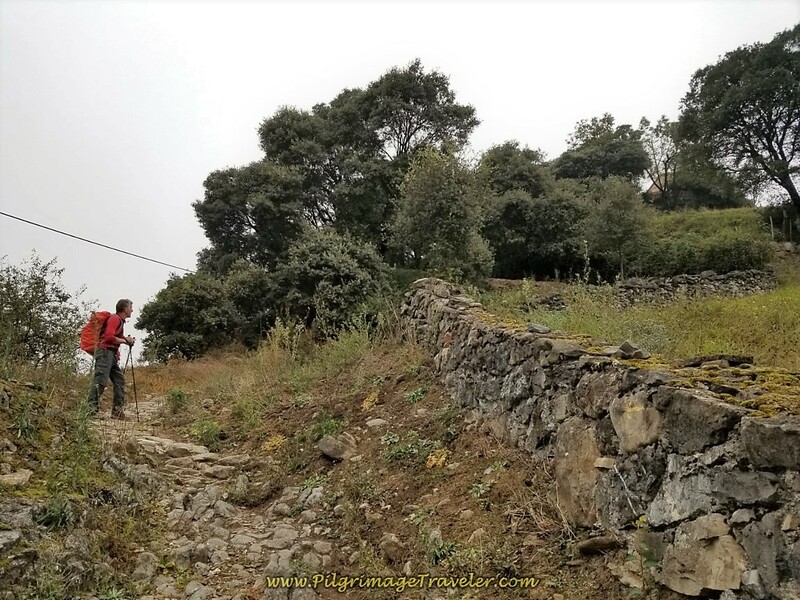 We started out our day in Campomanes, from the Hospedaje Senda del Huerna, a few meters off-Camino, at daybreak. It was a misty and cool September morning. Almost immediately beside the hotel, at the first intersection at the center of town, we found an early café bar open, the Café de Mary. It was fabulous to have an early coffee with milk and pastries. See the map for its location. 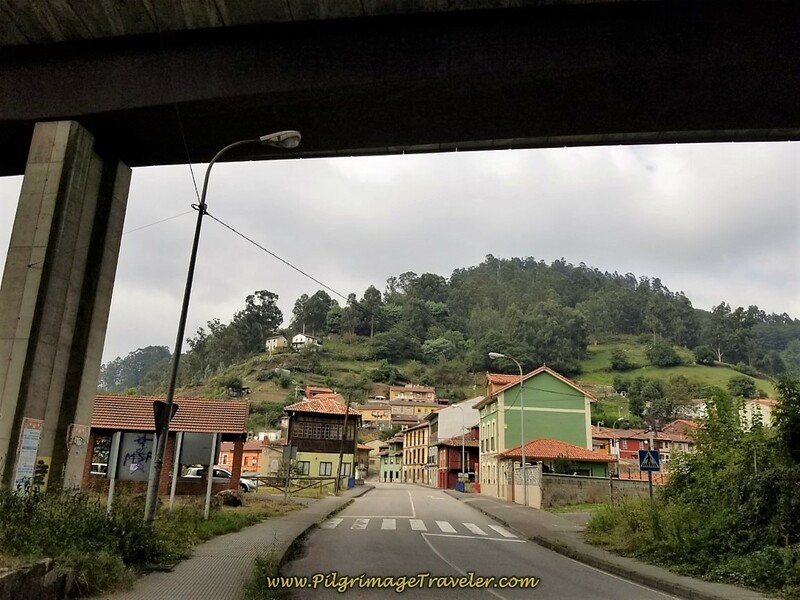 It is right along the Camino on the AS-242. 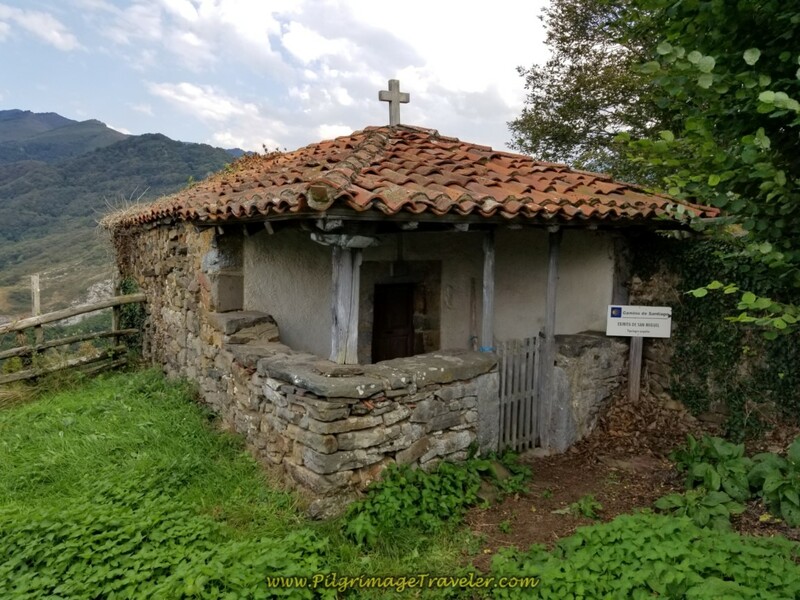 After filling our bellies, we set off and within a few meters on the main road, you come to the lovely little Capilla del Santo Cristo, below. I said a prayer of gratitude, as I always do, and continued onward. I was grateful for my knee to be actually working this morning! I hoped it would last for the day! 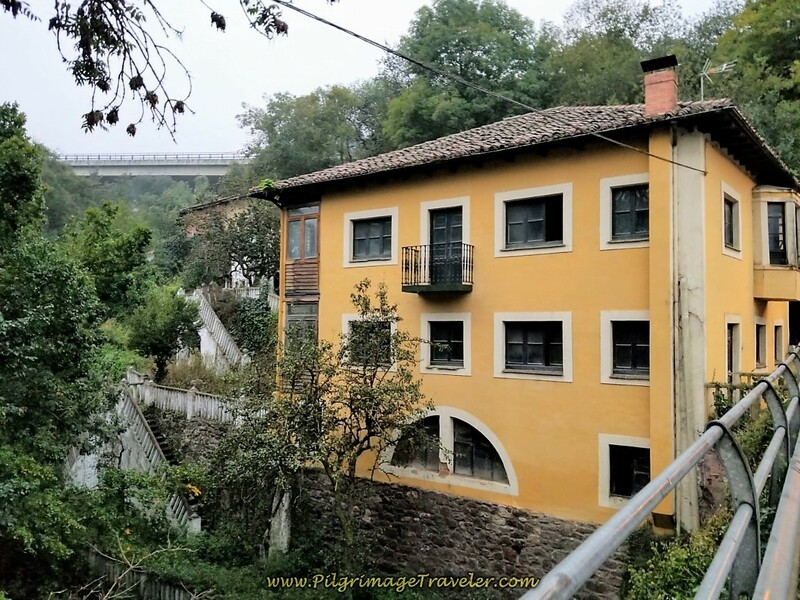 Within 130 meters, you cross the Río Huerno by this yellow house. It is in Campomanes, shortly after this crossing where the Río Huerna and the Río Pajares join together and become the Río Lena. After the yellow house, the AS-242 bends to the right (north), to follow the Río Huerno. 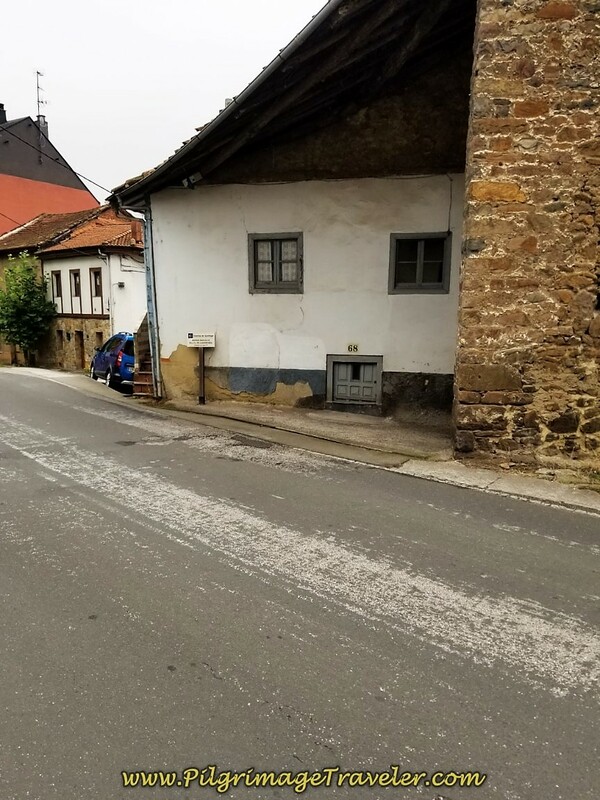 Within a few more meters, this lovely old stone house captured my attention and imagination. What a lovely place! We continued onward on the AS-242, leaving town and leaving the river. Here is where the Camino walks under the A-66. 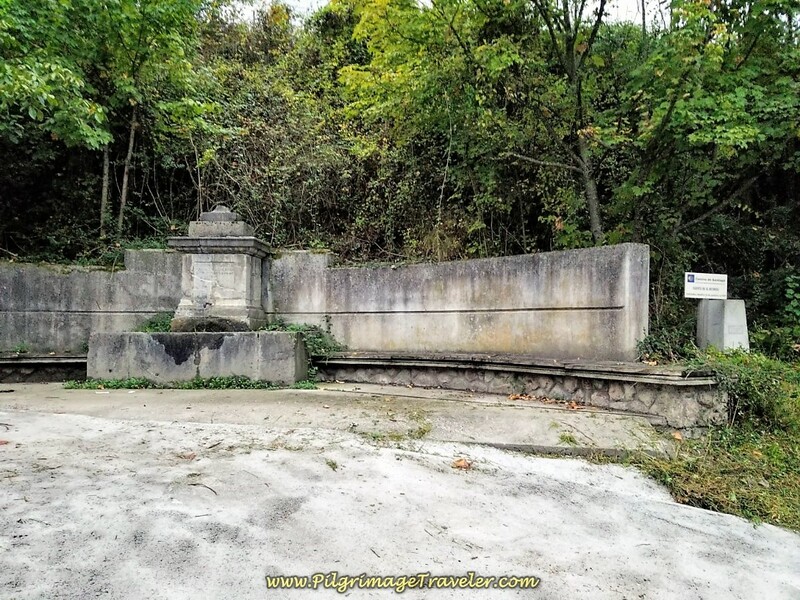 Immediately after walking under the overpass, you come to this historic Fuente de la Reondu, built in 1829, for "all those who pass by to benefit." The AS-242, as it travels northward, not only follows the path of the river, but the path of the A-66 as well. Not too lovely. I felt my spirits dampen a bit, reflecting the rather moody weather. 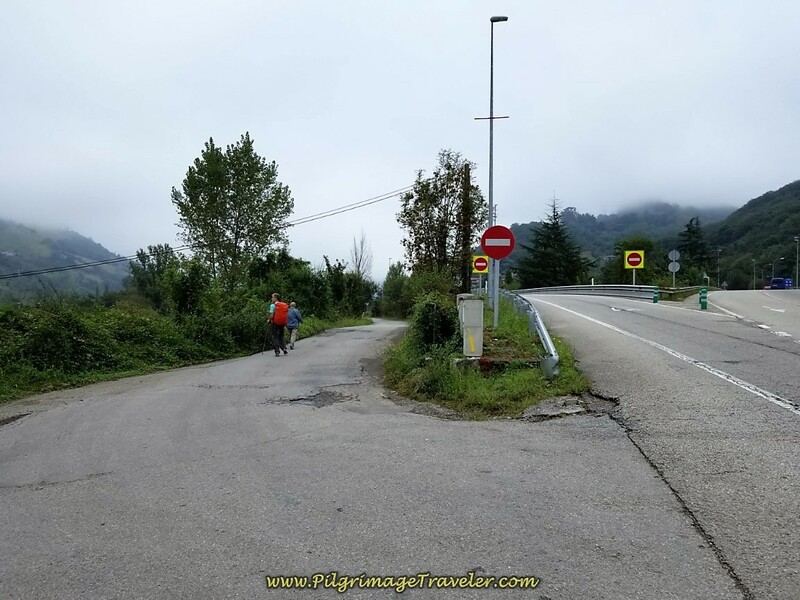 Staying straight on, pass the intersection for entrance to the highway, as the Camino continues to head northward for the next town of La Vega'L Rei (or Vega del Rey). 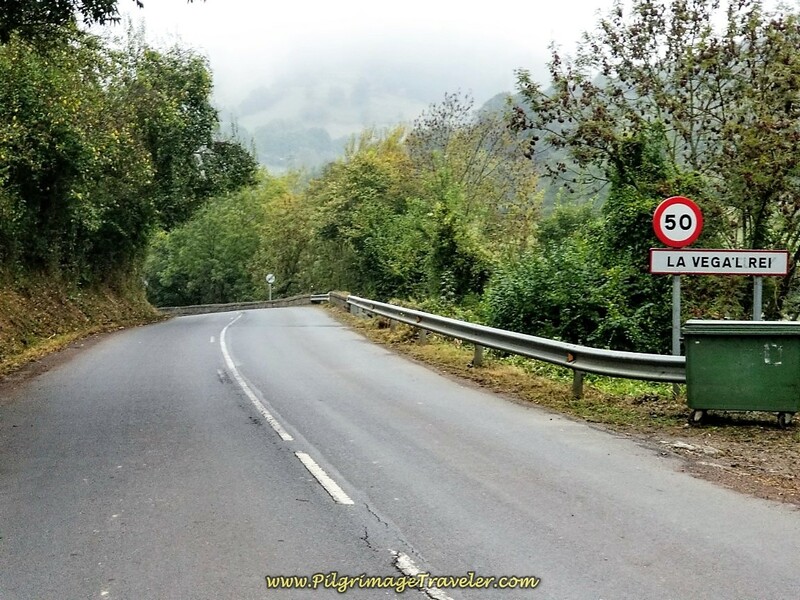 At 1.5 kilometers after meeting the highway, come to the sign for La Vega'L Rei. 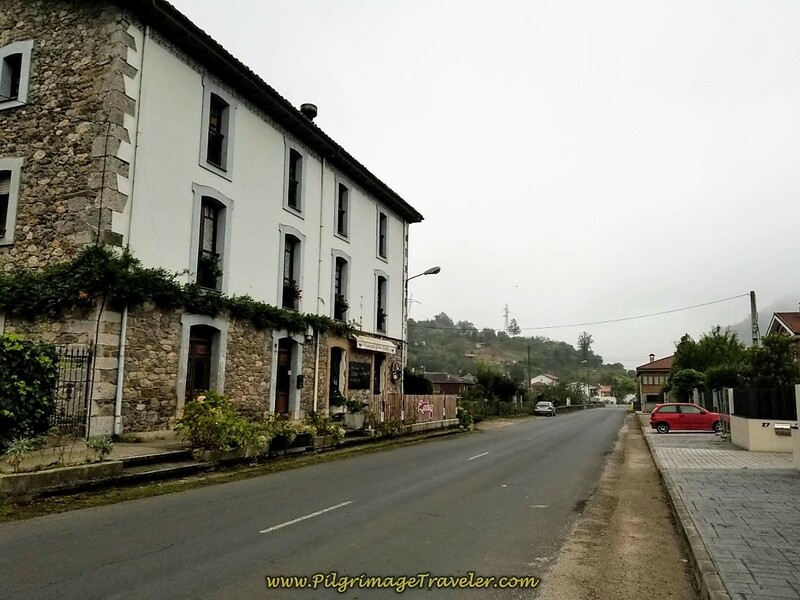 As you enter town, you will see the Restaurante Parador Del Rey. It was closed in the early morning as we passed. Their web site lists their opening hours as 11:00 ~ 6:30. Just a few meters past the restaurant, look carefully for this lovely hórreo, decorated with corn and potted plants, shown below. You will see it before the yellow arrow and the footbridge that you must take to cross the highway. Take a right turn to cross the footbridge. I thought it was a bit confusing when we reached the other side of the footbridge. I don't recall seeing a good waymark. The correct direction is to turn right onto the rural paved road, shown below. 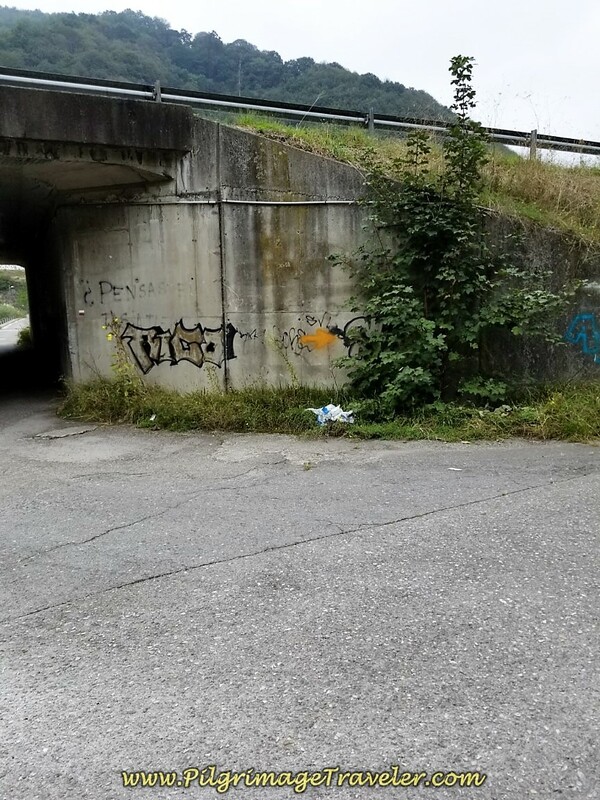 In only a few meters you will see this tunnel ahead. 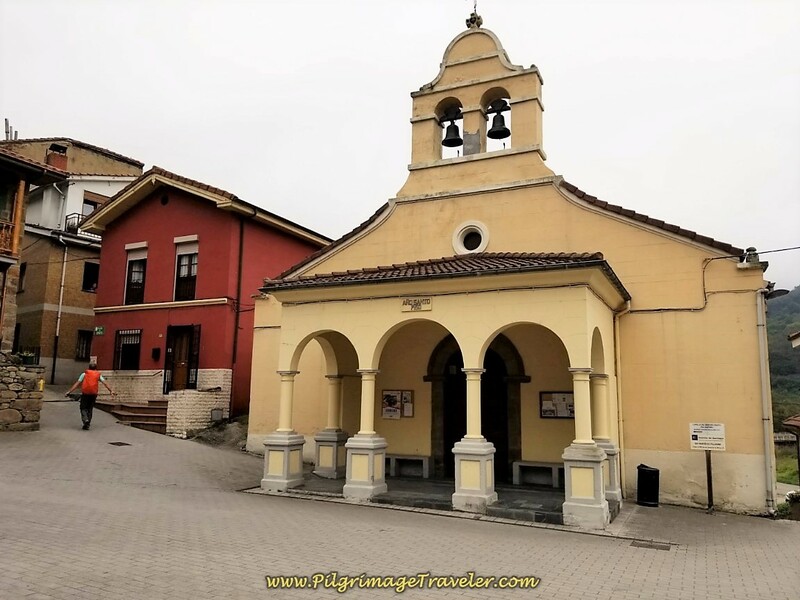 We knew we were on the right track, when the yellow information board, below, identified that we were arriving at Santa Cristina de Lena church. 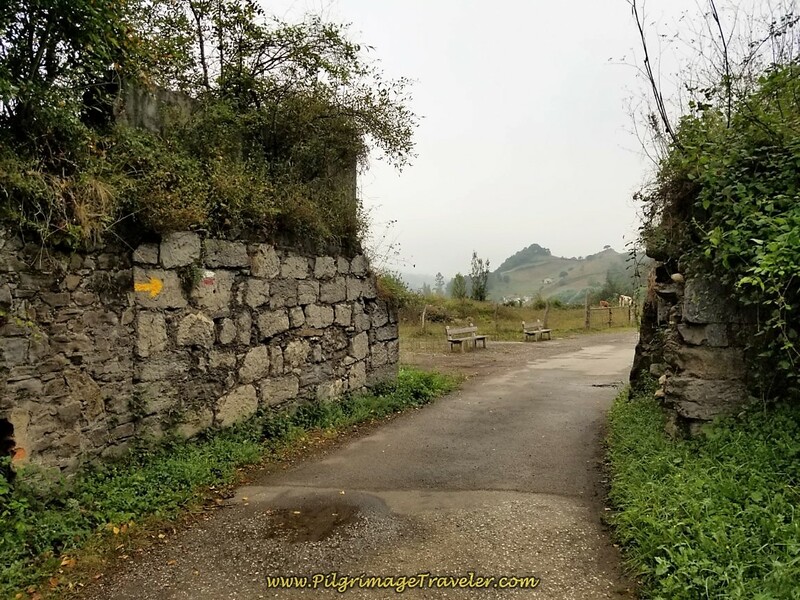 After walking through the tunnel immediately come to this information board and a stone wall with a yellow arrow, directing you onto the path up the hill to the pre-Romanesque church. 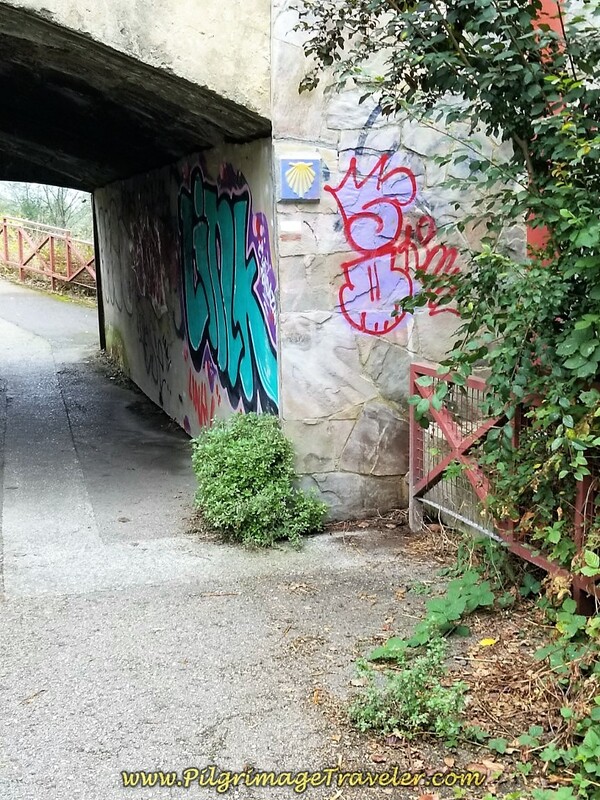 It is about 120 meters on the road, from the footbridge to here. 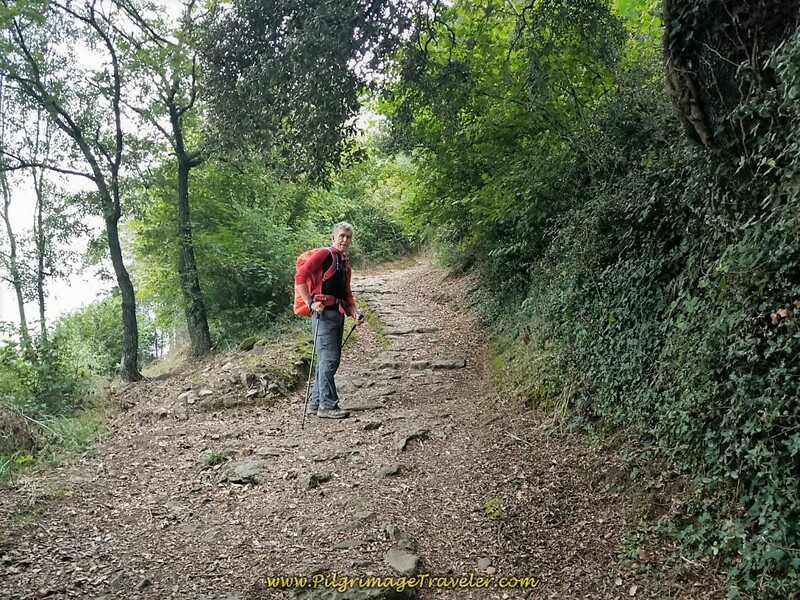 Begin the short steep climb on the ancient road. The rocky path peters out and becomes a pleasant dirt path through the trees. There are still remnants of the ancient paved road. It is a short 200 meter climb up this hill to the hermitage. It is at 3.2 kilometers into day five of the Camino del Salvador, that suddenly, the small church looms above you. The road to the right in the photo below is from where you arrive. 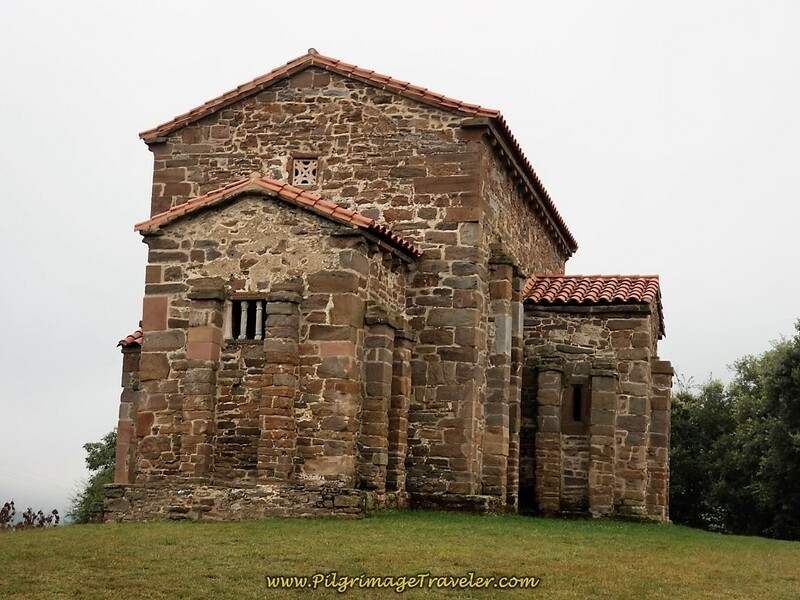 The hermitage of Santa Cristina de Lena was built in the 9th century and is of the pre-Romanesque style. 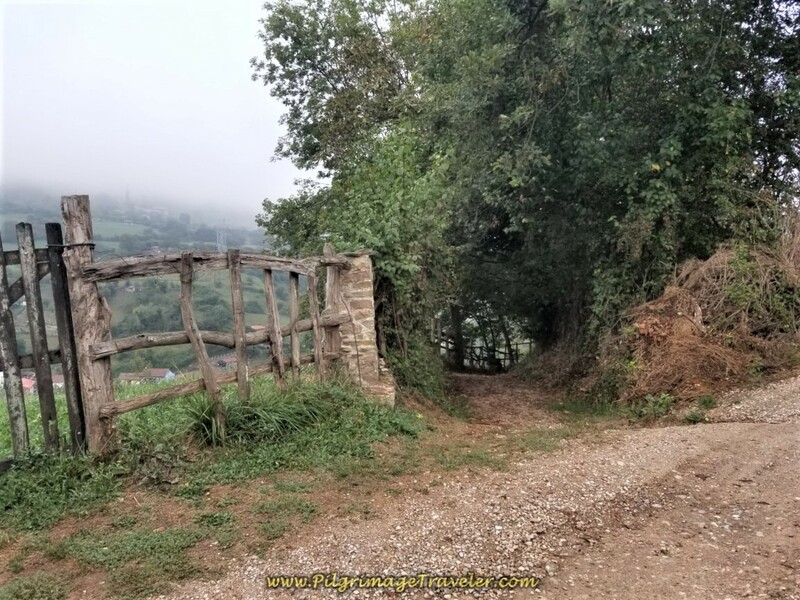 Click on the Asturian link for more information on this ancient place. You will see a brief description of the history, its admission price and current hours of operation, that change by the season. 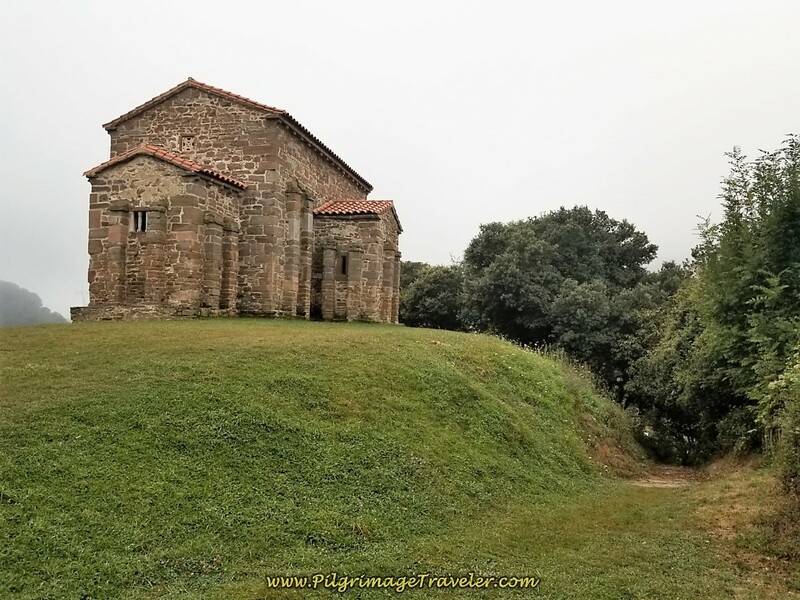 Santa Cristina is one of five UNESCO world heritage churches in and around Oviedo. 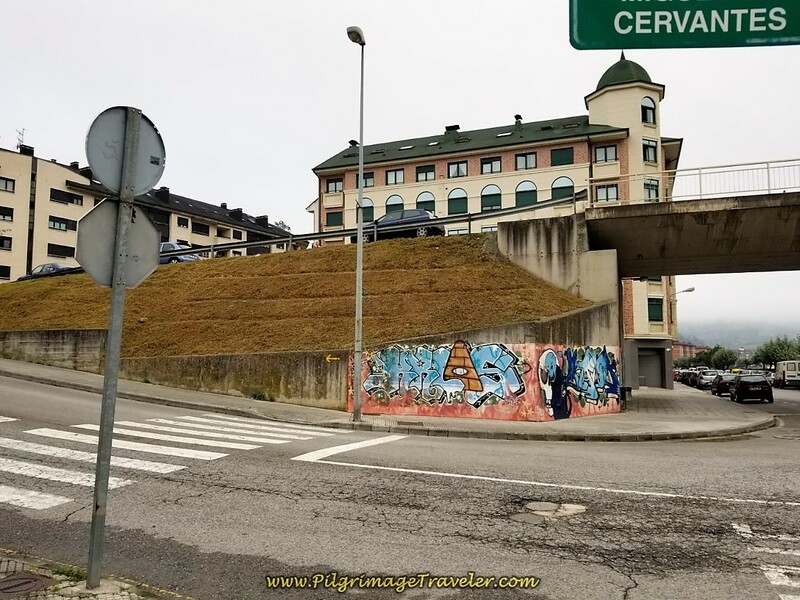 It is closely related in style (pre-Romanesque) to the two churches at the Naranco site on a hill just west of the city, the Oviedo cathedral's ancient center remnants called the Cámara Santa, and the fifth is the San Julián de los Prados Church, also in Oviedo proper. 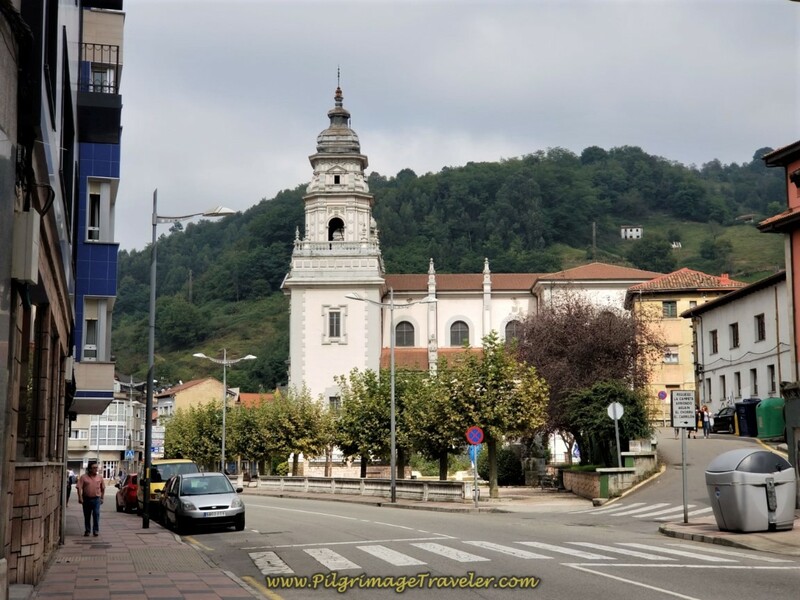 If you are interested in seeing all five of these churches, you can see the remaining four once you reach Oviedo. Click on the links to my articles for photos and more information. These are fascinating historic places. It was a shame that we did not arrive here at opening hours. Plan your own day accordingly if you wish to see inside. It is only open 11-1 and 4:30-6:30 in the summer. The church sits on its own little serene hilltop where the surrounding views are phenomenal. The morning mist during our visit added to the mystique of the place. Unfortunately, when we were there about 9:45 in the morning, all you could hear was the rush of traffic from the A-66 below. I could only imagine when the original builders chose this amazing spot, how much more tranquil it must have been! Looking northward from the hermitage, you will see a gravel road. Walk toward it, but find the path going down the hill to the left. It is by the gate shown in the photo below. Take this inviting path instead. It is marked with yellow arrows. 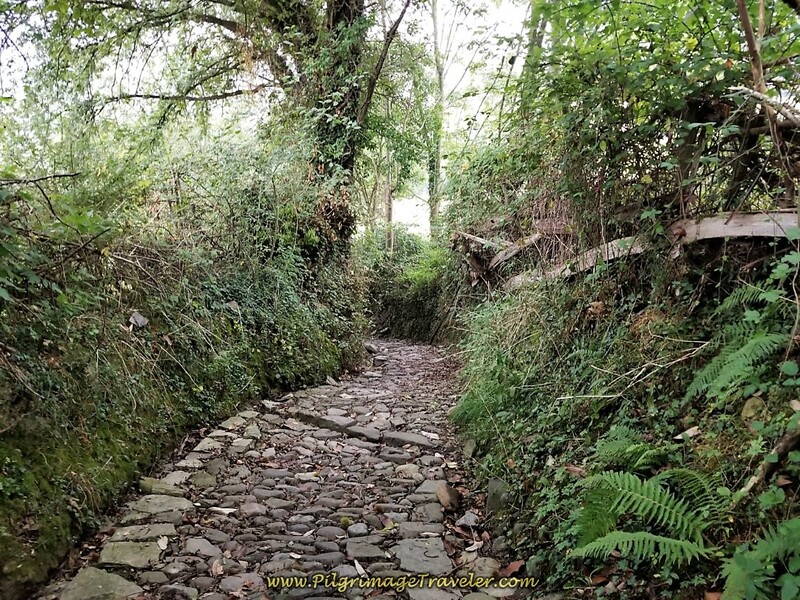 This lovely path winds down the hill for 400 meters, on the ancient road, towards the next town of Cobertoría. Once again, though brief, this downhill was very hard on my left knee. I needed to do my half-march again, picking up my left knee as if in a march, to avoid the extension that caused it so much discomfort. 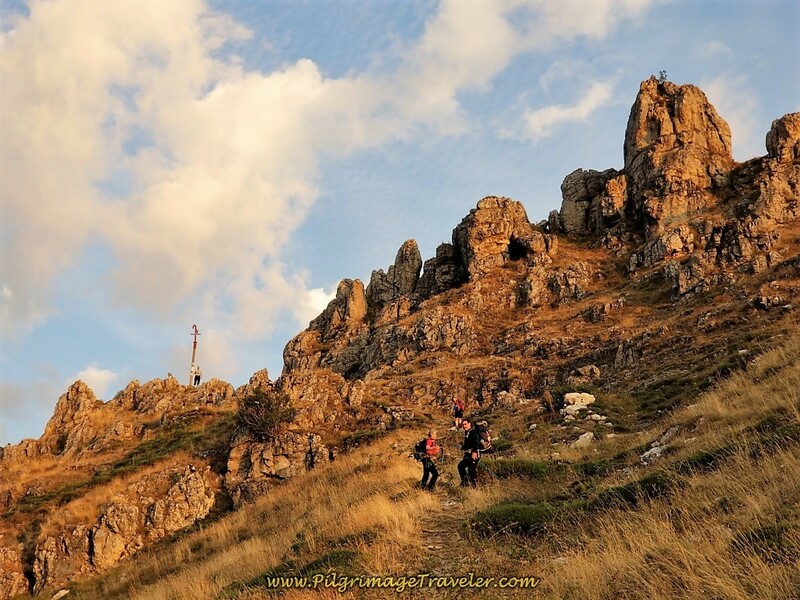 I also heavily relied on my hiking poles to reduce the weight on my legs. I was quite a sight, going down the hill! 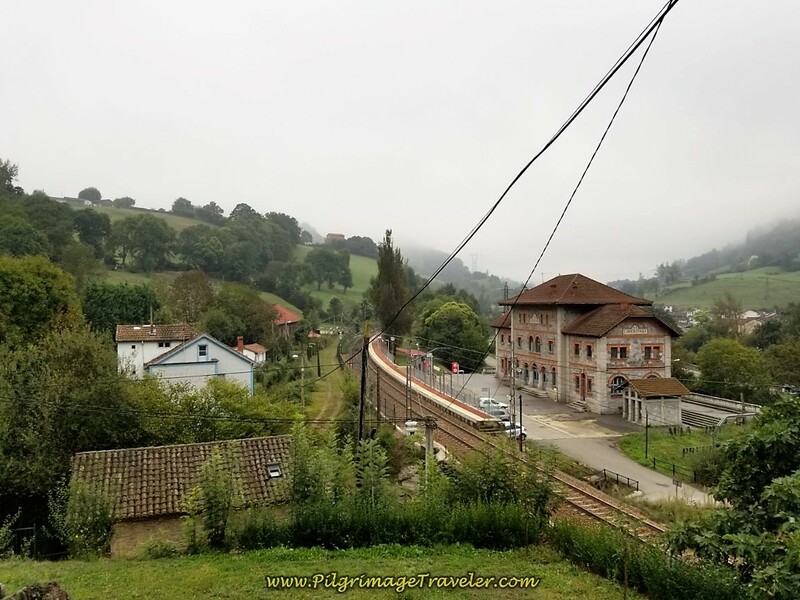 And then through the trees, as they begin to open up, you will see the old train station of La Cobertoría, which is now used as a museum and interpretive center for pre-Romanesque art. 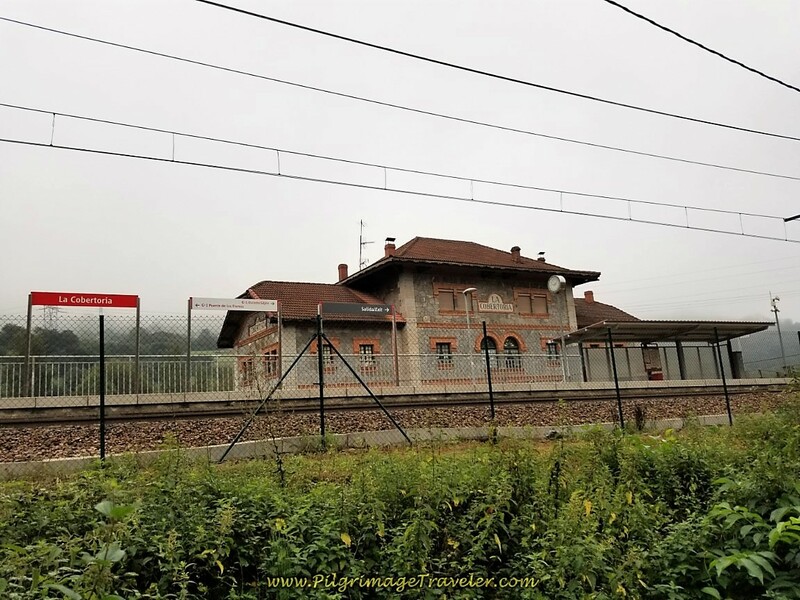 Walk on the road by the railroad tracks, and after passing the train station, cross a stream on a bridge and come to a T-intersection in town. Turn right and up the hill. Take your first left, in town, and continue the strong climb up the hill. There are no services here in this small town. Be sure to look back at the top of the hill and catch your final views of the hermitage, and the train station below. The view is worth the pause. 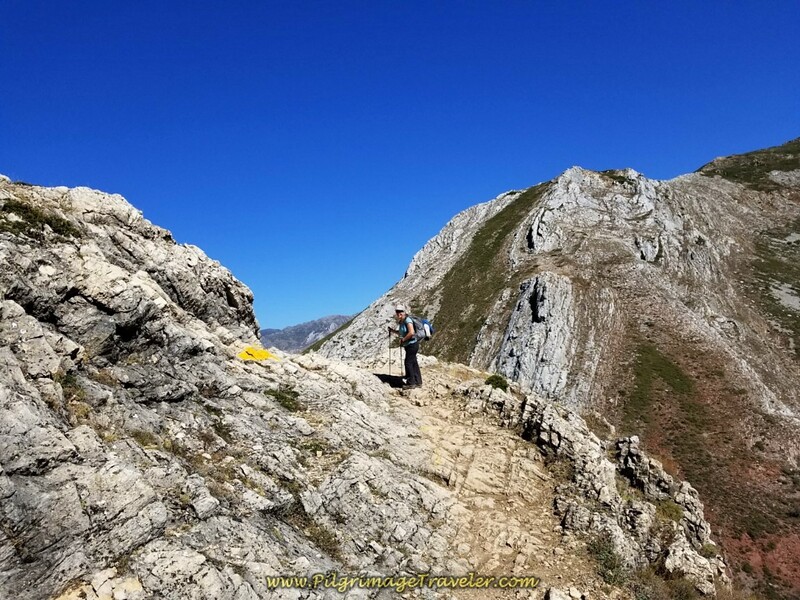 Here is Rich climbing up and out of Cobertoría. The climbs felt good on my left knee, and I felt strong. 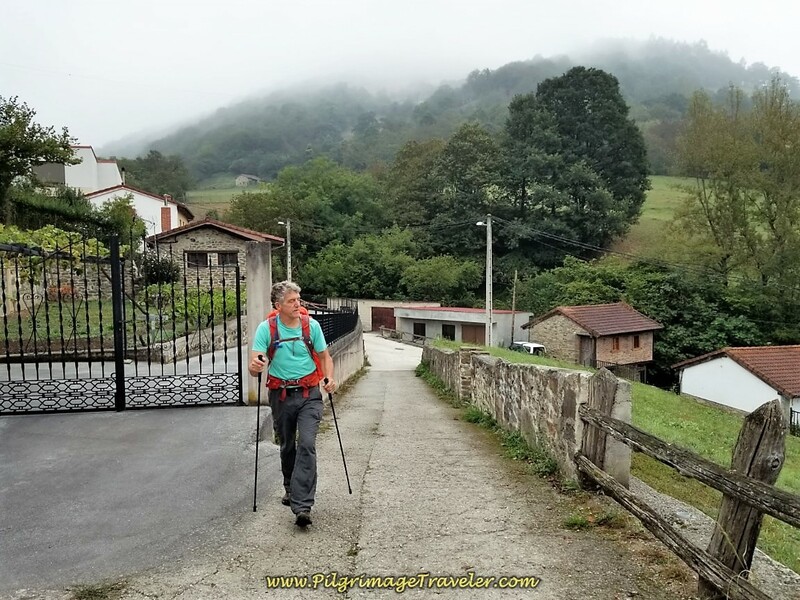 However, on the downhills, even though mild on this day five of the Camino del Salvador, my knee continued to give me discomfort once again. 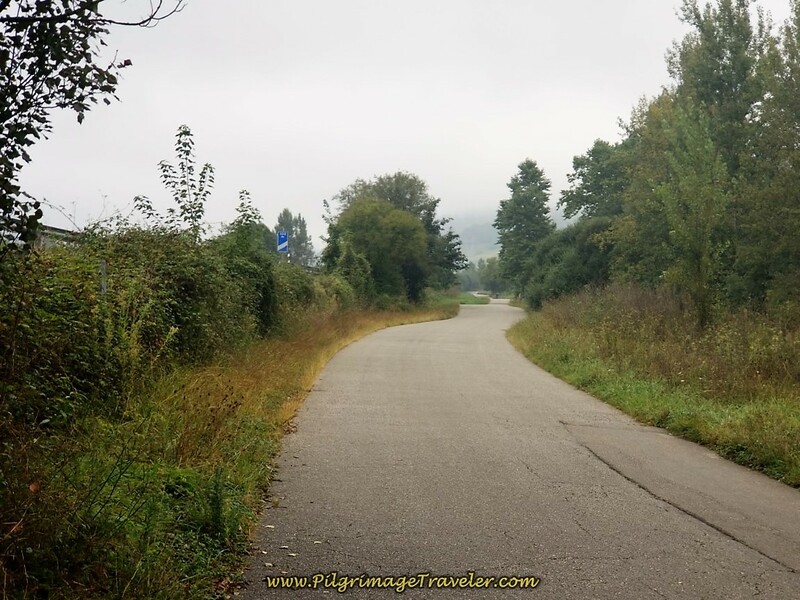 You continue on the very narrow road with no traffic for about 1.14 kilometers. 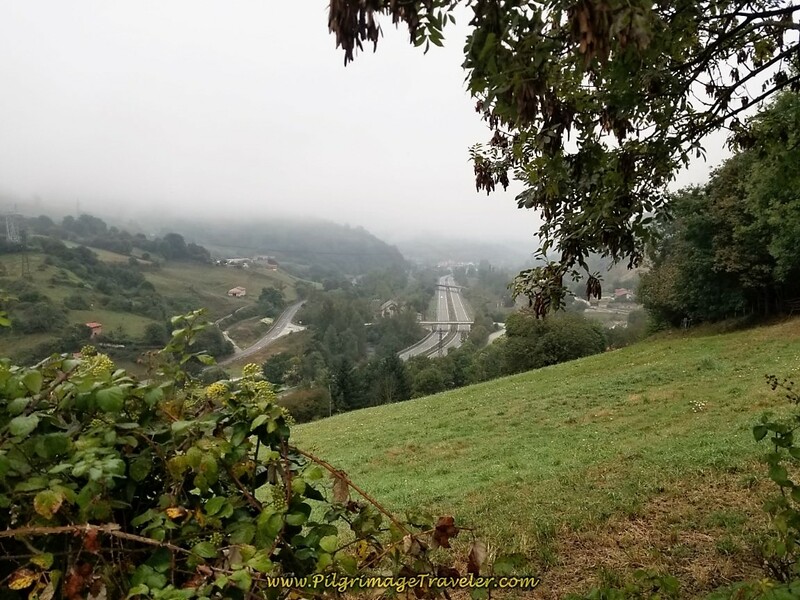 While the Camino is very rural here, you can constantly hear the traffic of the A-66 in the valley below and to the left; not too great, for sure. 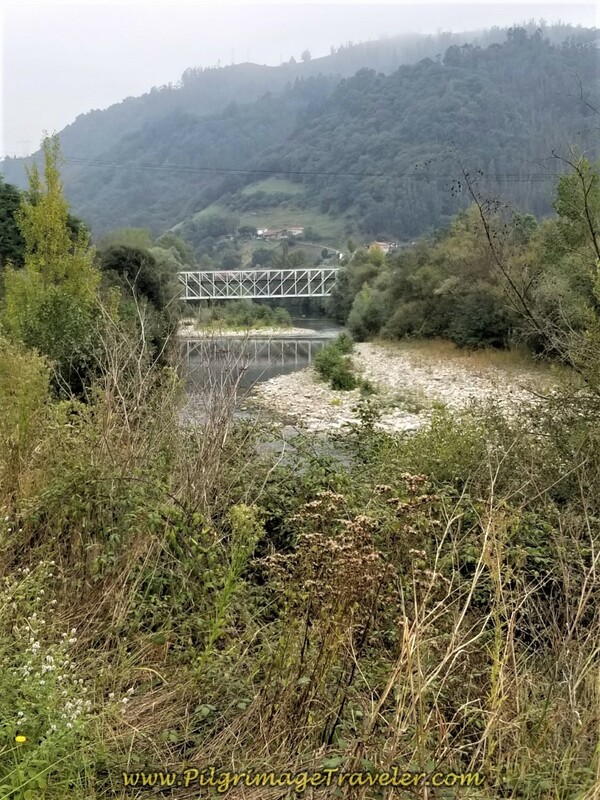 At 4.9 kilometers into day five, come to this footbridge shown below, and take it to cross the Río Lena again to continue on the Camino del Salvador. This is a photo that shows the attractive old stone homes that line the river banks on both sides. Turn right after the bridge in the town of Vega del Ciego. You barely see the town to the west as you continue to parallel the A-66, on another very rural road. You can see the highway directly to the left in the photo below, and of course, you continue to hear it. 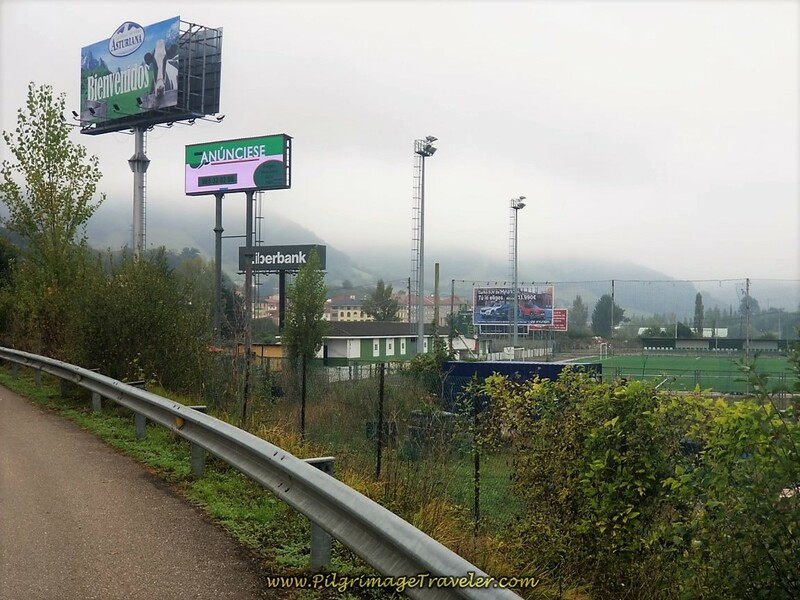 In one kilometer after the footbridge, you enter the southern part of La Pola de Lena at this soccer field. 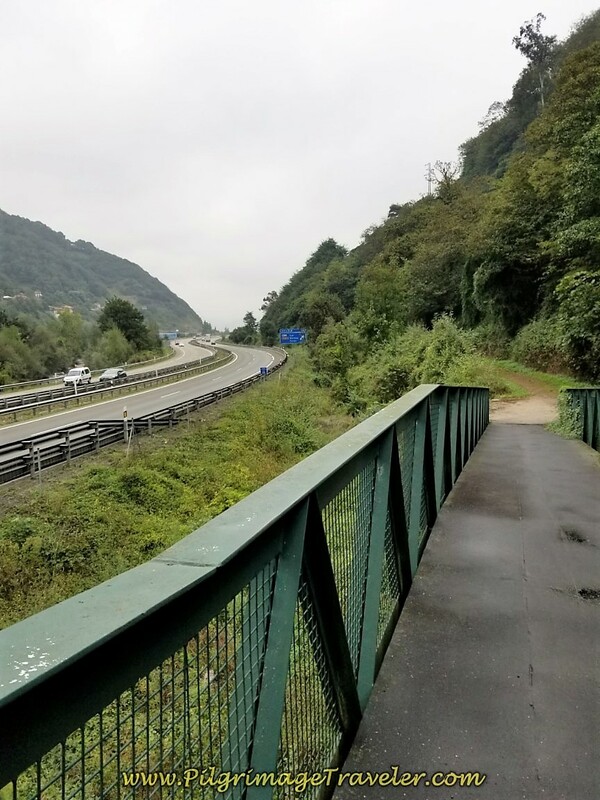 About 350 meters later, the Camino takes a left hand turn at this tunnel that will take you under the A-66. On the other side of the tunnel is this funky path for a few meters, leading you into the center of town. Come to a T-intersection and take a right to walk on a paved road for 300 meters more. 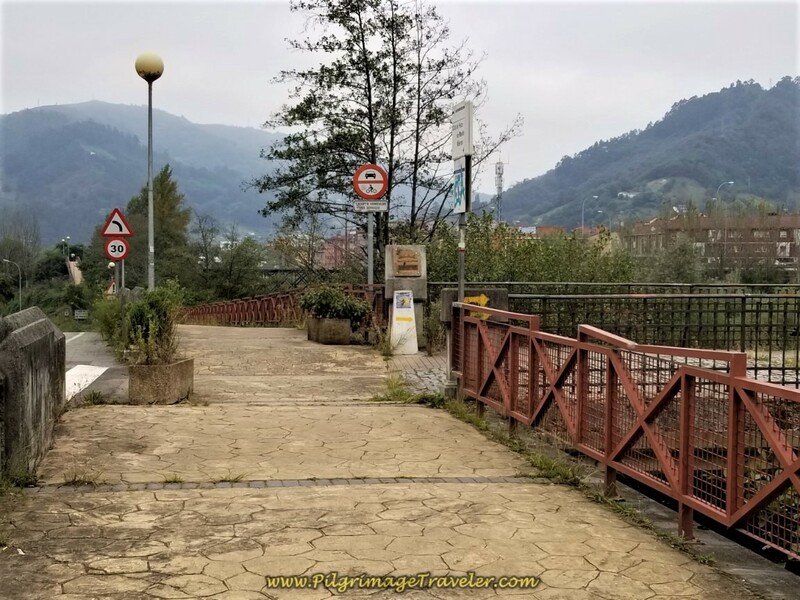 At 6.8 Kilometers you have now entered the center of town when you come to this intersection with bridge, graffiti and the prominent building shown in the photo below. Turn left here, just before the bridge. 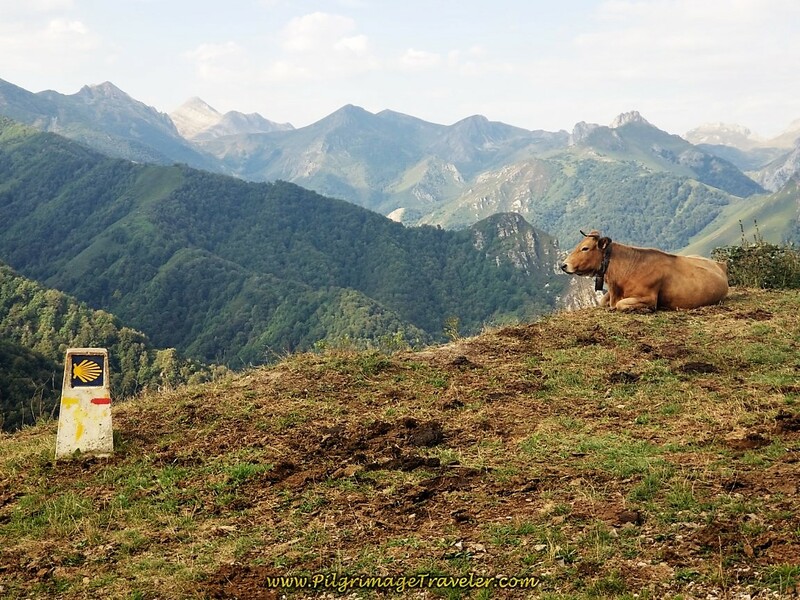 Take the very next right hand turn in a few more meters, and you will obviously be in the center of La Pola de Lena. This is a big town with lots of services. The main drag through town is a bit more than a kilometer long, and you will encounter everything you need. Almost immediately we saw the Alimerka supermarket. We stopped and bought supplies to replenish our packs. A few meters onward we liked the look of the Bar El Trasiegu, below, so we went in for a coffee break after only seven kilometers. We decided to take advantage of the opportunity, after having many days with almost no services. Almost exactly halfway through town, you come to the town hall. It is the yellow building in the photo below. 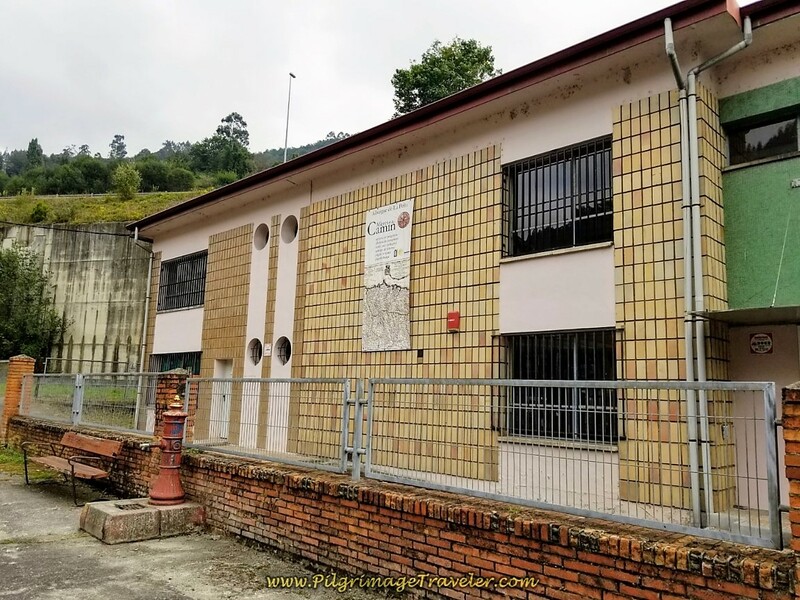 Just before it, are the yellow arrows painted on the wall, letting you know this is the turn for the municipal Albergue de Peregrinos San Martin. You can see the yellow "A" painted on the wall next to the arrow on the left. 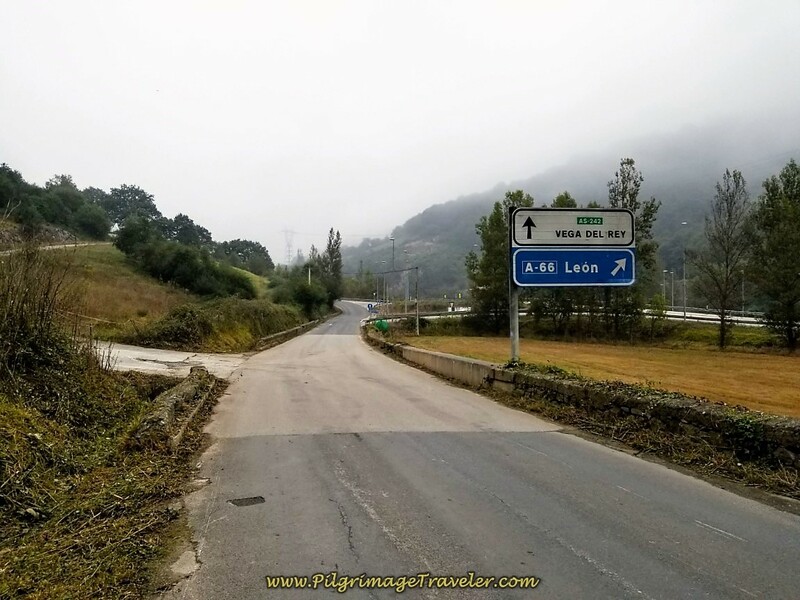 Turn here if you plan to complete your day in La Pola de Lena. There are many choices of accommodation in La Pola de Lena, if you choose to end your day here. 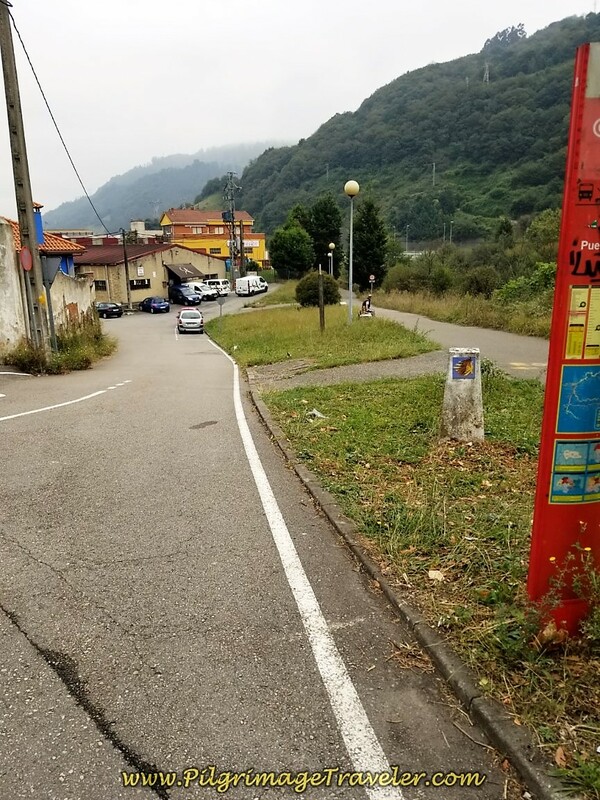 The actual Camino continues on the main street, as you can see by the arrow pointing to the right. In another 1/2 kilometer from the town hall, you turn right here, at this tall building. It is just before the Día supermarket, the red sign in the photo below, and just after the college, Colegio Sagrada, a prominent red brick building. We found the waymarks hard to find at this intersection, so if you have read this, you will know where to look. There is actually a concrete waymark here, if you look closely in the photo below. We were setting a pretty slow pace for the day, after our marathon the day before. At near midday, the mist still hadn't cleared. As I look at the photos it seems very gray, but it never did rain. After the turn, walk through a roundabout and cross a bridge over the Río Lena once again. At the interchange with the A-66, the Camino del Salvador turns to the left and picks up the frontage road on day five. I think I said out loud, "Are you serious?" 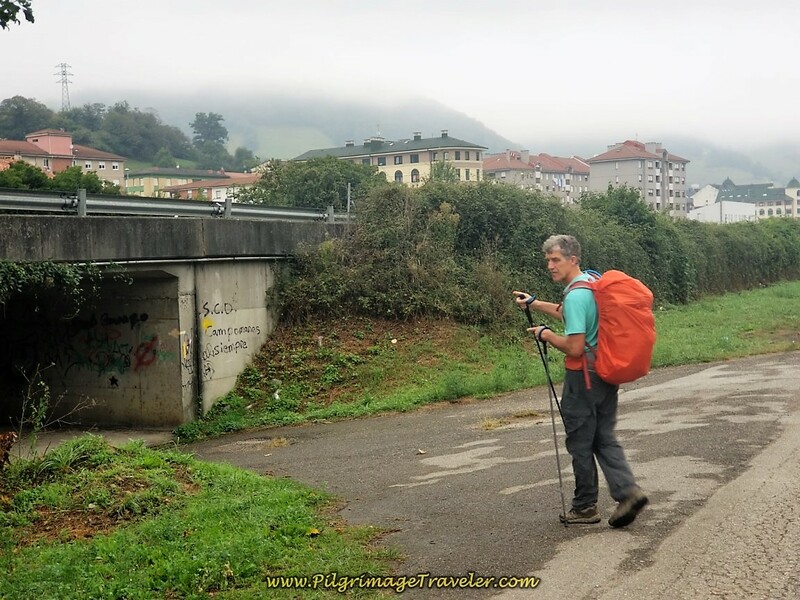 I was really hoping the Camino would drop down by the river, or something else, other than walking by the noisy A-66 again! You have to walk on this frontage road for a full 2.25 kilometers! When you come to the long industrial building, below, you know you are nearing the end of this stretch. 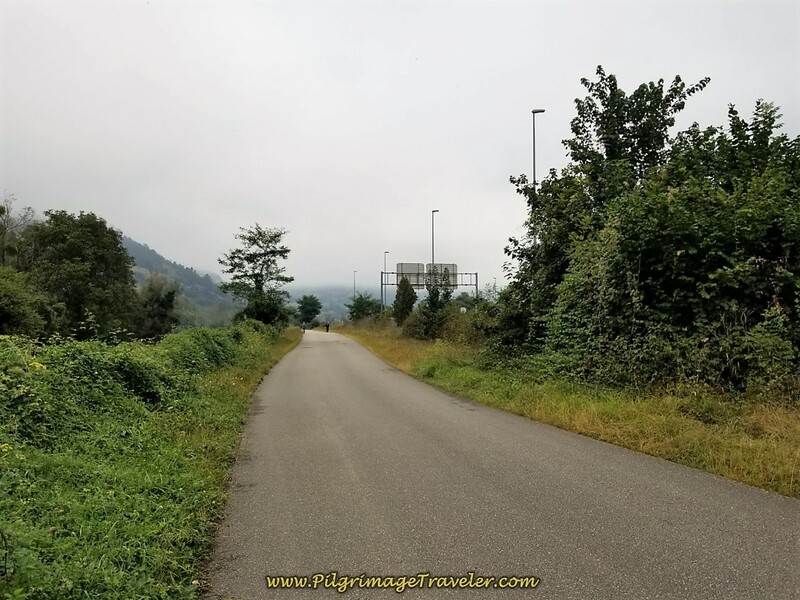 This frontage road brings you out by the Cepsa truck stop at about 10.38 kilometers into day five on the Camino de San Salvador. It was here that we got very confused. We could not find any waymarks. We asked a local at the truck stop and he had no idea! You can see by our GPS tracks that we doubled back, looking for a waymark. None. Perhaps we didn't backtrack far enough, I'm not sure. You can see on the Google map above, if you zoom in, that there is a small road that bends to the left just before the truck stop. This road takes you around the back of the Cepsa and into the next town of Villallana (alternatively Villayana). We saw no arrow leading us left before the gas station. 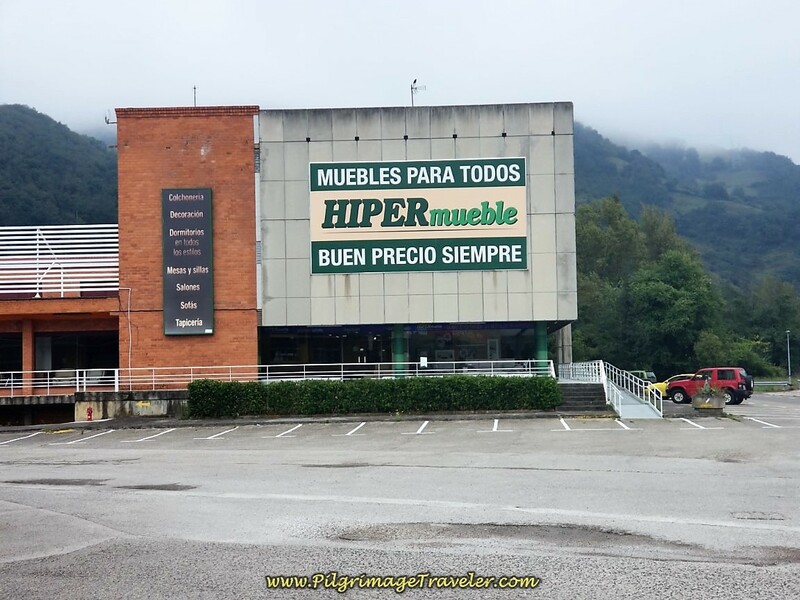 Since we didn't know about the turn before the gas station, we kept walking, and sure enough, past the gas station and past a restaurant, we spied a yellow arrow pointing to the left on this next building, a furniture (muebles) store. You can see the yellow arrow below the white fence, painted on the concrete if you look closely in the photo below. It is impossible to anticipate the turn before the gas station, as you don't realize where you are until you come upon it. Just walk by it, heading for the furniture store that you can see clearly ahead with its yellow arrow. Whichever way you chose, the distance will be the same to Villallana anyway. Turn left by the furniture store and onto a road that winds around by the back of the Restaurant Expres. Take the first right turn towards town and cross the Río Lena again. Take the next right after entering town and come to the Plaza de Cristo and the town church, shown below. Pass the church, and walk up the hill to join the AS-242 in a few meters. 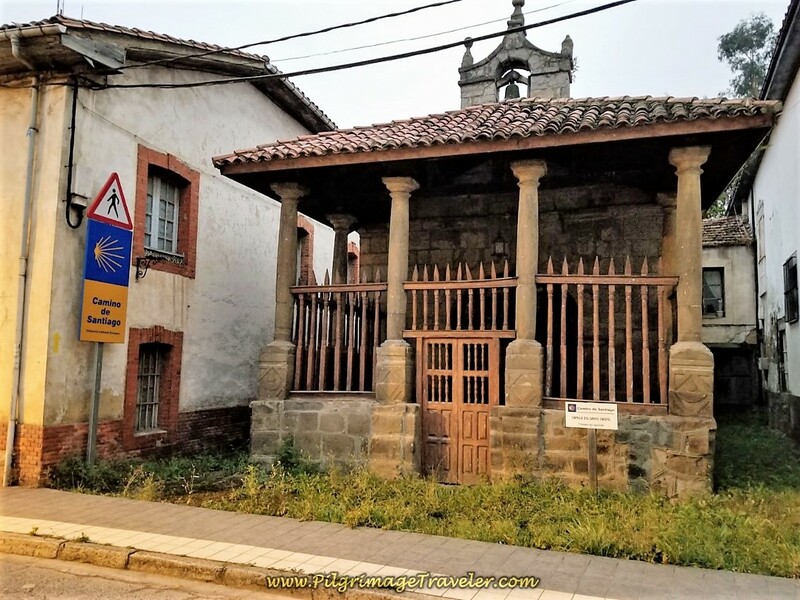 The Camino turns right here, but if you look to your left, you will see the old 16th century pilgrim's Hospital de Nuestra Señora de la Alberguería, built in the 16th Century. You will have to take a few steps to the left to identify the building by the sign in front of it, shown in the photo below. There is another café here in town and the Apartamentos Riospaso (+34 985 49 66 19) if you can go no farther. See the Google map above. 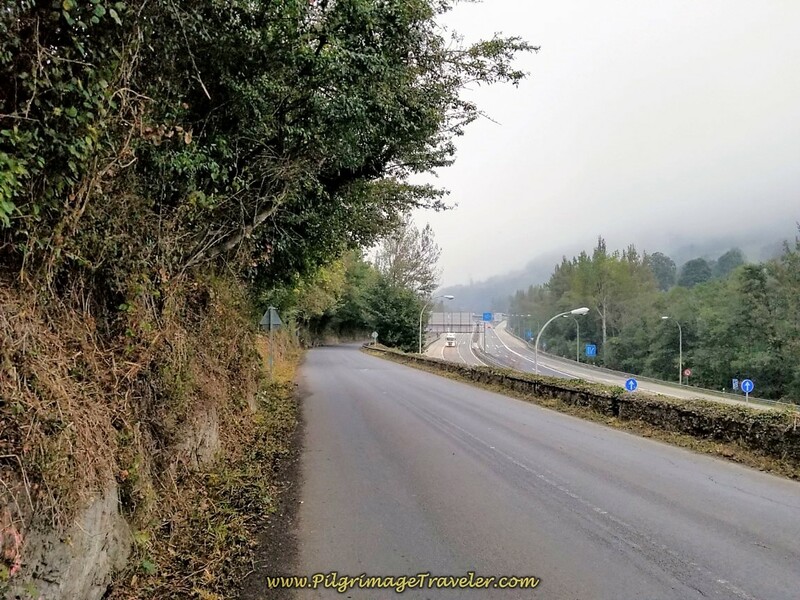 After turning right onto the AS-242, you will be rewarded with a blue Camino de Santiago sign, below left, assuring you that you are on the path. Pass the leaving Villallana (Villayana) sign, below right. After leaving the hospital, it is a gentle glide down the AS-242 for approximately 1.85 kilometers. You will see plenty of yellow arrows and concrete waymarks along this stretch. 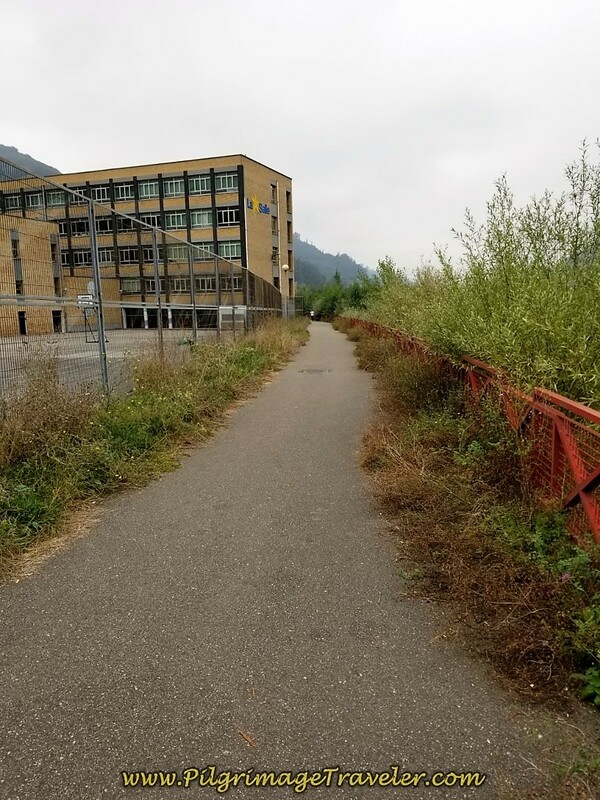 After walking by a large industrial building on your right, followed by a big bend in the road, look carefully for a cluster of old stone buildings for the next turn. There was a yellow arrow on the pavement, below left (the photo is looking back), telling you to turn right. 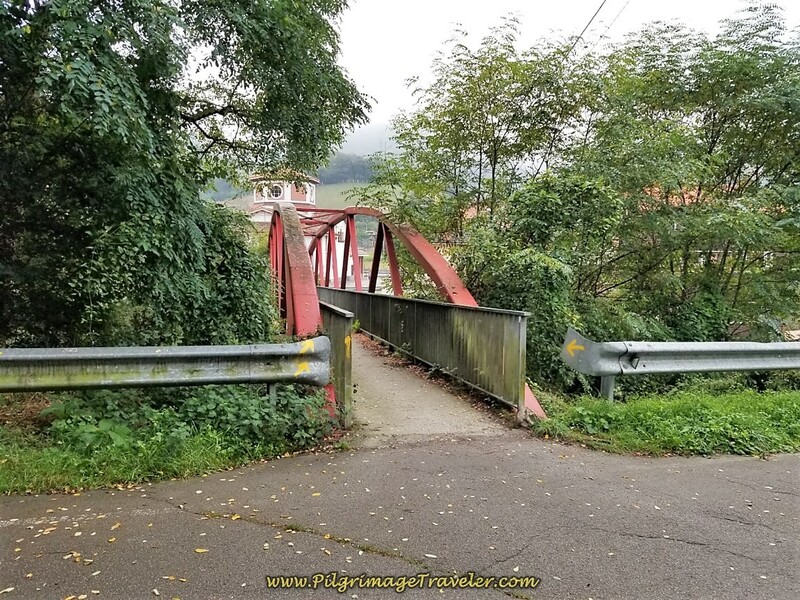 The goal is to find this footbridge, below right, to cross the Río Lena and the highway again. There is also a small, old, stone chapel-like structure just after the bridge (not-pictured). It looks like at one time it may have been a church. Coming down the opposite side of the footbridge, the Way turns into a nice dirt lane. Unfortunately, the dirt doesn't last for very long, and soon turns to pavement. It is a walk of 1.1 kilometers along this road. Next, pass a tunnel, below left, keeping straight on the road, continuing to follow the A-66 on your left, photo below right. 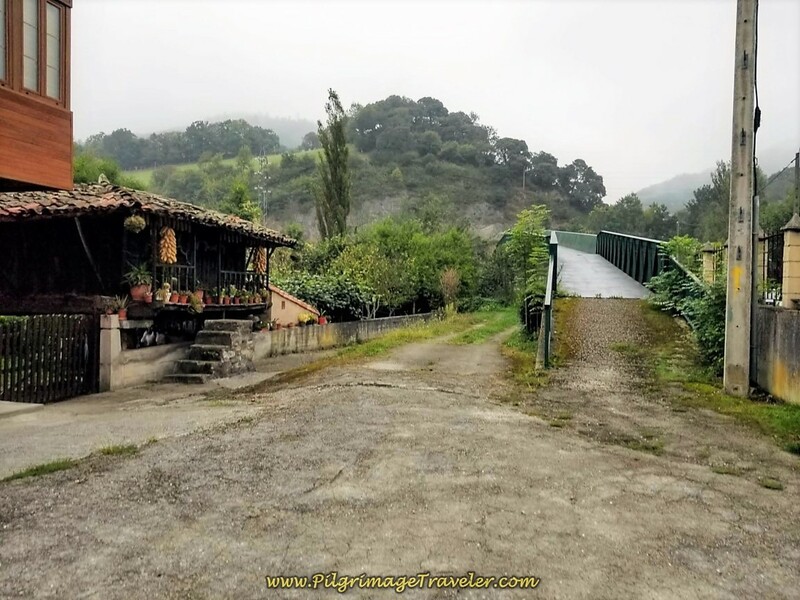 At about 14.0 kilometers into day five, the Camino de San Salvador joins a river trail system of the Río Aller, just after the Starglass Company and a building that looks like an old train station, and crosses the river on this wooden footbridge. below. While you have been walking along the Río Lena from the south, you have crossed the Río Aller from the east. Here is where the two rivers join to become the Río Caudal. 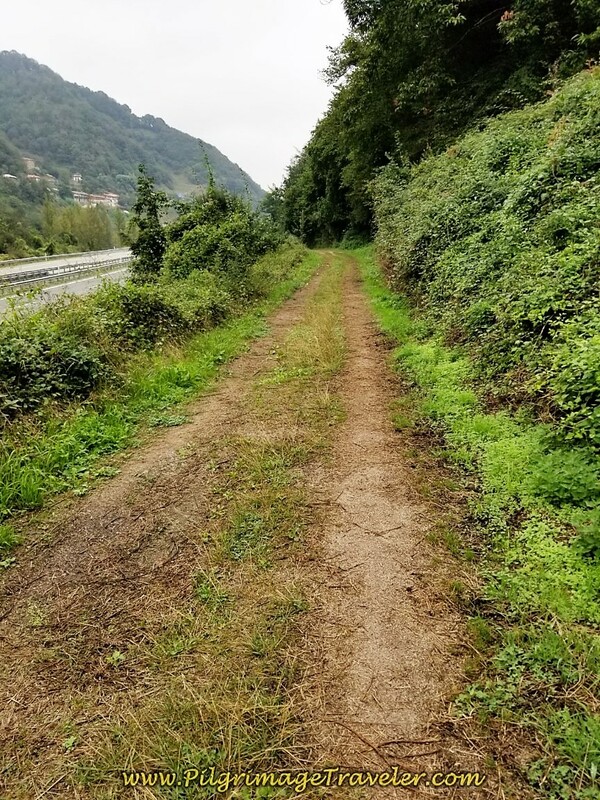 It will now be the Río Caudal that you will follow all the way into Mieres del Camino, for a total of more than six kilometers. 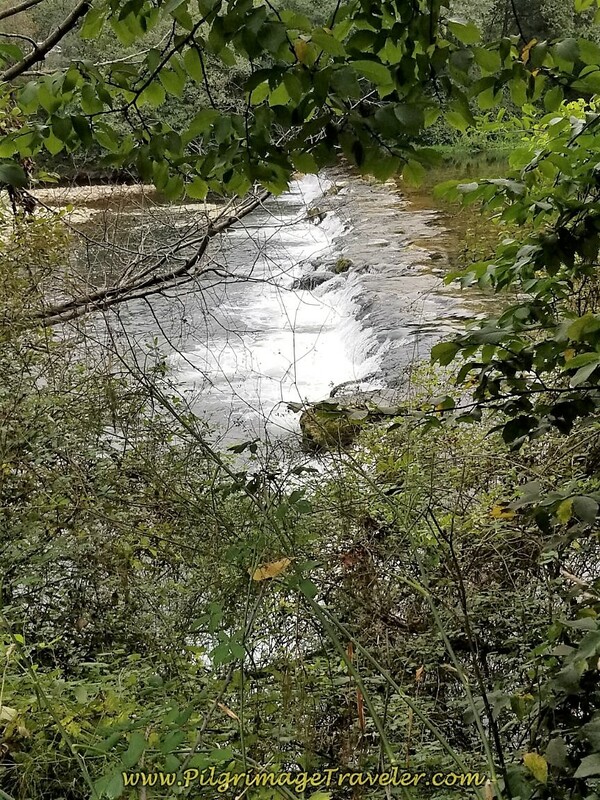 Continue along the Caudal River trail system after the wooden footbridge that walks you under the A-66 and through a park area, bending to the north. 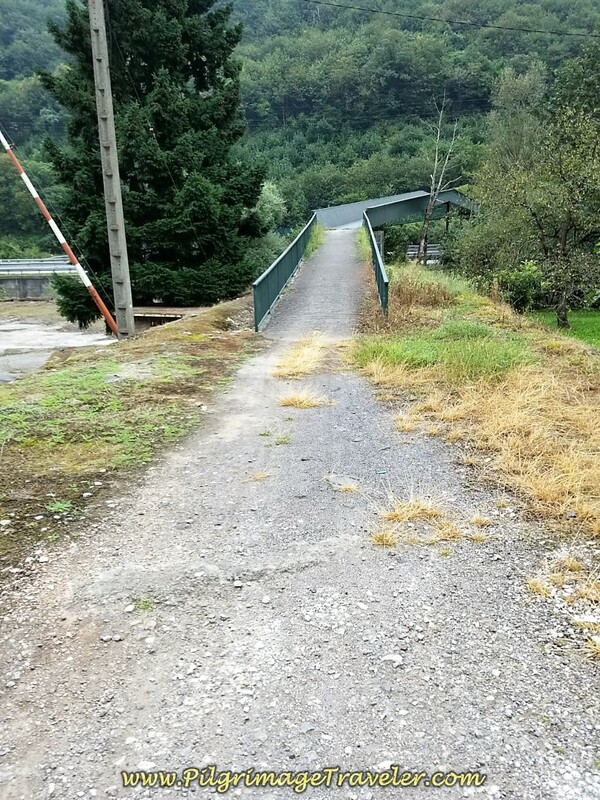 After 380 meters thru the park, turn left at this bridge, shown below. Cross the Río Caudal on the road. 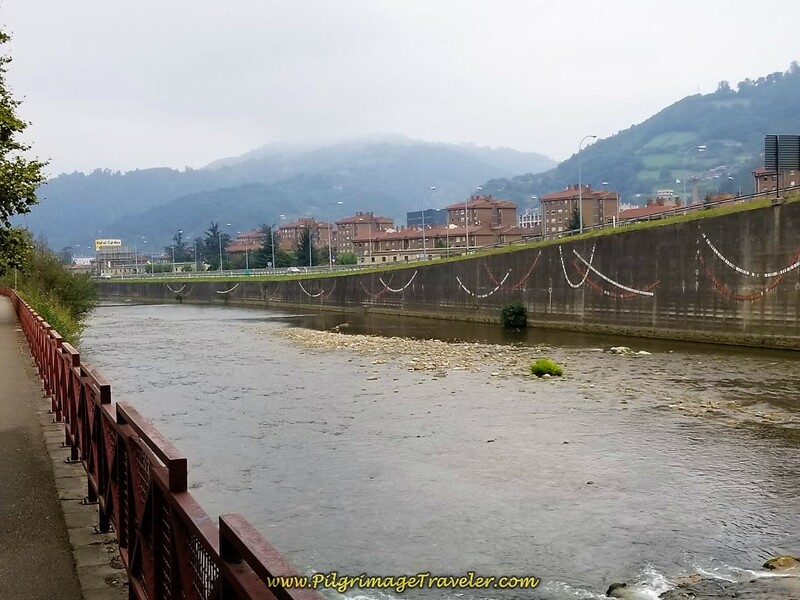 Immediately after the bridge, turn right and pick up the river walk on the west bank of the Río Caudal. You have entered the town of Ujo at 14.48 kilometers. There are several concrete Camino waymarks here, so you shouldn't miss the turn. There are no accommodations in Ujo, but there are lots of cafés if you don't mind walking off-Camino a bit. I did not mark them on the Google map above, as they are not conveniently located. 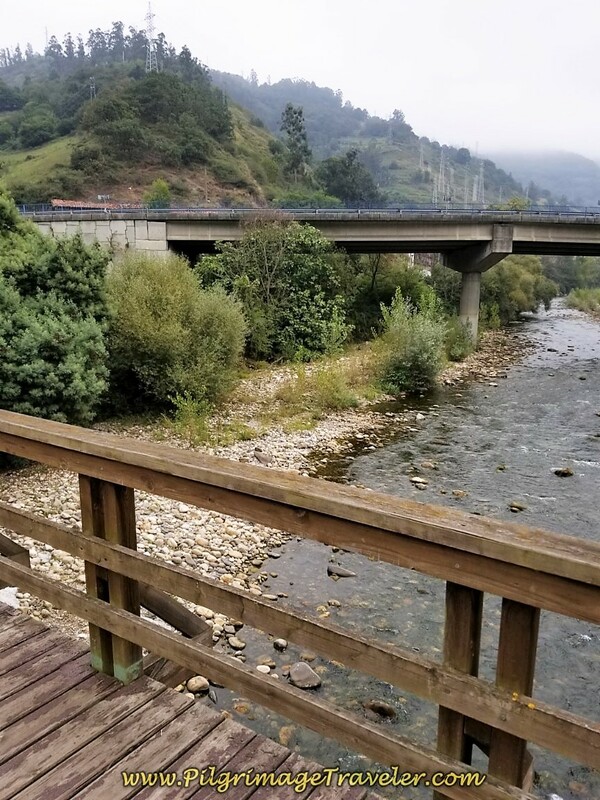 You will be walking along this riverwalk for the next 5.75 kilometers until Mieres del Camino. 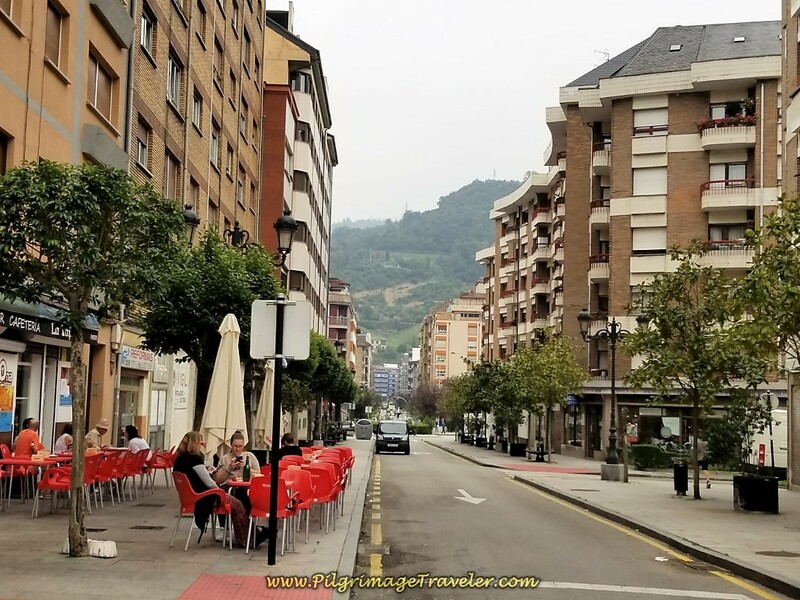 There are more cafés along this stretch as you near the large city of Mieres, but many are difficult to reach because of fence-lines and the parallel railroad tracks. 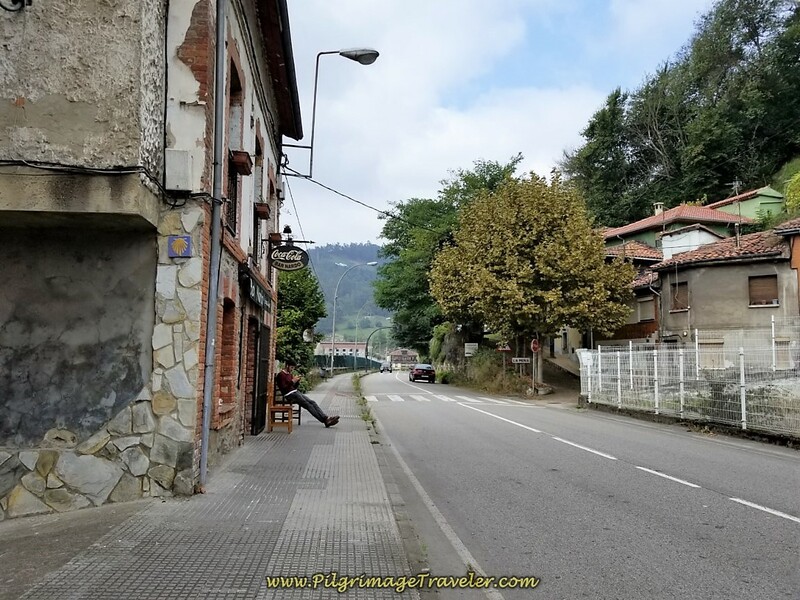 Plan on waiting until you get closer to the center of Mieres for a stop, if you need one. It is a pleasant enough walk along the river, if rather boring, as you can see from the next photos. The Way is easy and all downhill. Pass by several interesting geographical features. While the photos look relatively serene, the constant noise of the highway echoing through the valley continues to be your background music. This long riverwalk is popular with the locals as an exercise trail. 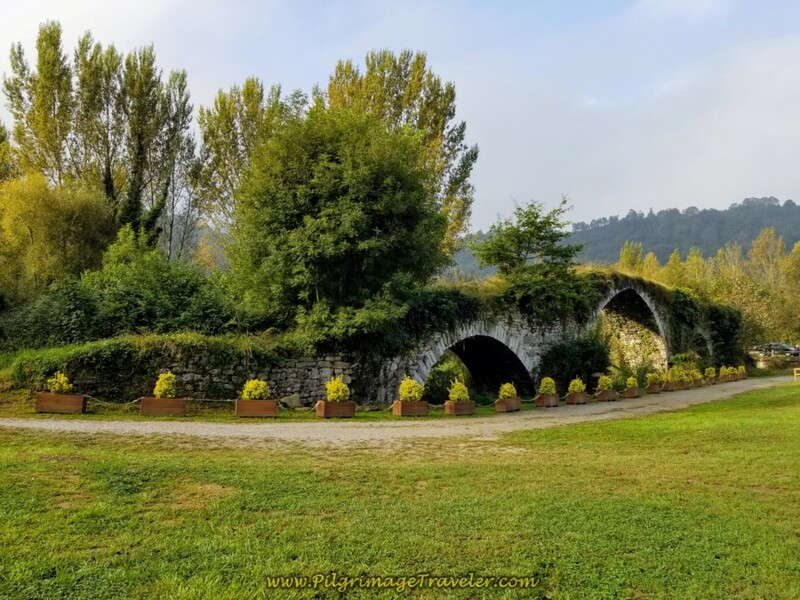 In the town of Santullano, walk through this tunnel, under a road. 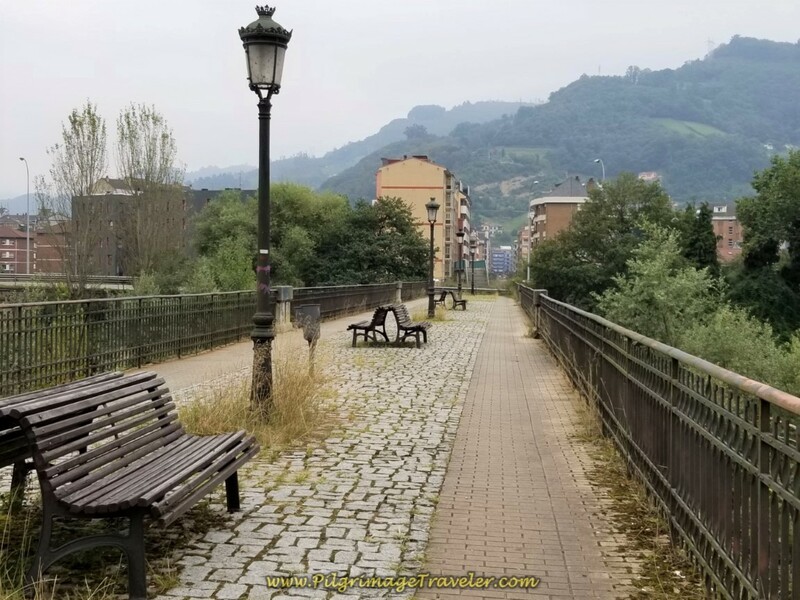 You will know you are entering the main part of Mieres, when you come to this decorated part of the riverwalk. 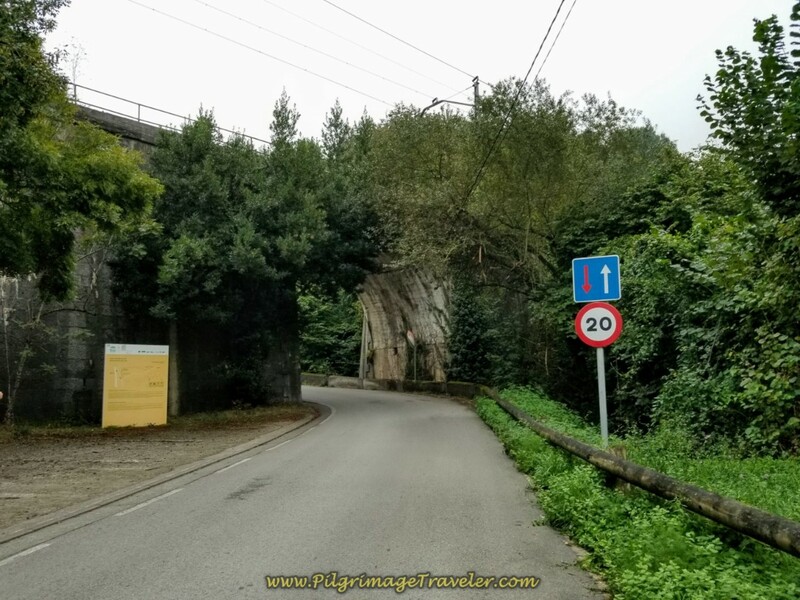 And finally at 20.225 kilometers into day five on the Camino del Salvador, come to this intersection with a bridge, telling you to turn right and enter into the center of town. Below is the bridge that takes you over the Caudal River and the adjacent railroad tracks. After crossing the bridge, you stay straight on and eastward, picking up the street, the Calle Manuel Llanesa. Immediately, you are greeted by tapas bars. Continue walking through the center of town on the Calle Manuel Llanesa. We passed a big park on the left, lined with several cafés. We were very hungry and sat down at one of them. 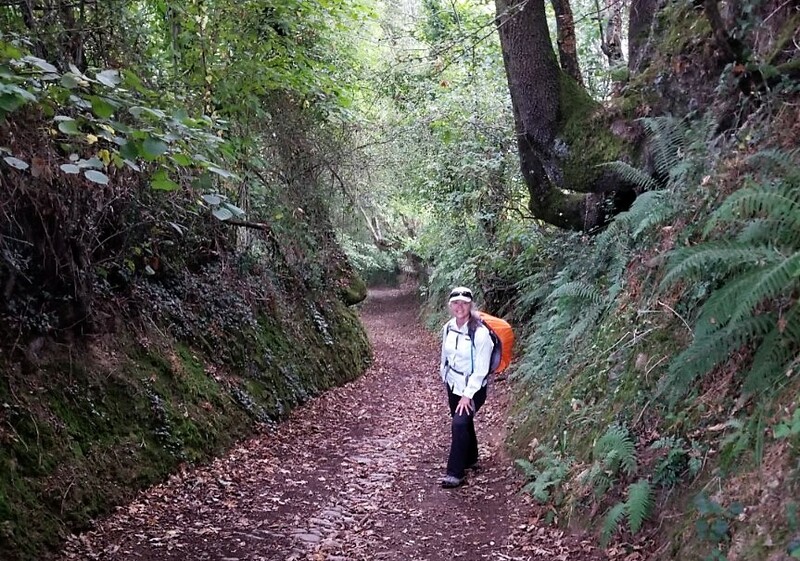 Unfortunately, they did not serve food, so we drank our beers quickly and carried on down the Camino. 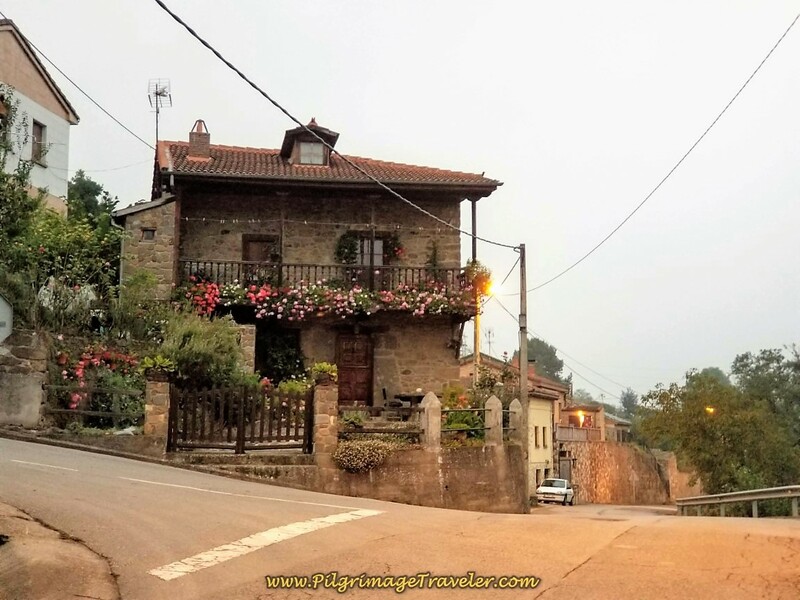 The Hostal Pachín is just after the park, a few steps off the Camino, if you are interested in staying in town. 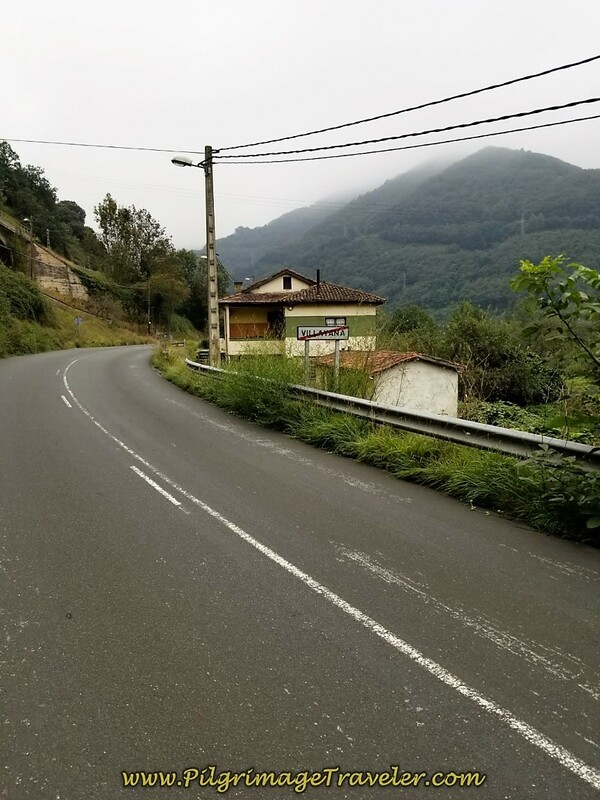 After 650 meters on the Calle Manuel Llanesa, make a left turn northward and onto our old friend, the AS-242, shown below. The street is called the Calle Teodoro Cuesta and you can see the prominent church ahead, the Parroquia de San Juan Bautista. 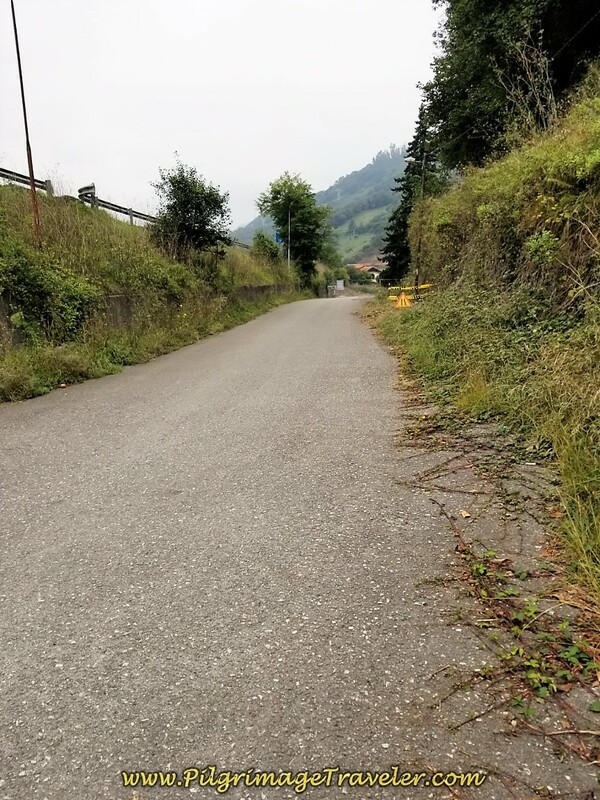 At this turn you have only 1.85 kilometers left to go, on a straight shot to the albergue. 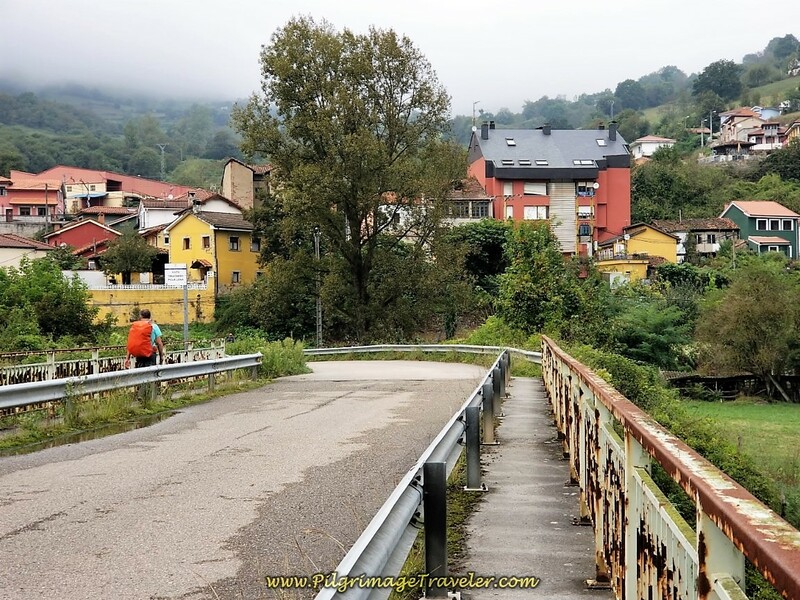 There are many accommodations within Mieres, if you wish to stay here instead of the albergue. Click here for a list of them on booking.com. 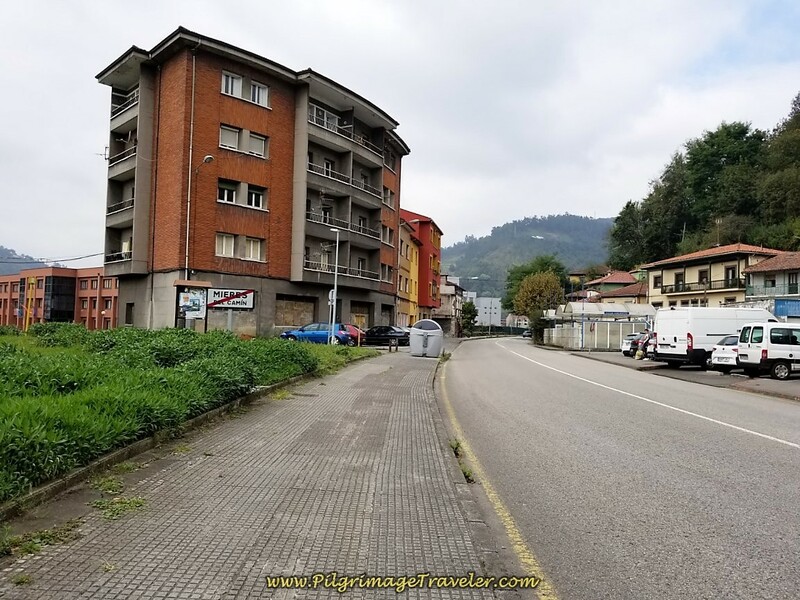 There are two accommodations, just south of the church (turning right at the intersection just described), the Hotel L'Albar and the Inmobiliaria Goncasa. 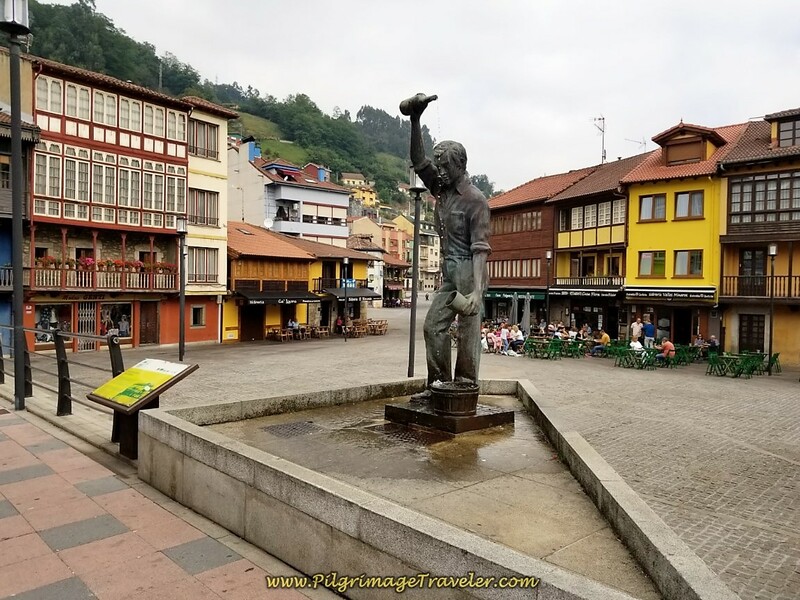 Just after the church, pass the famous Plaza de San Juan Mieres with the statue of a man pouring the cider. 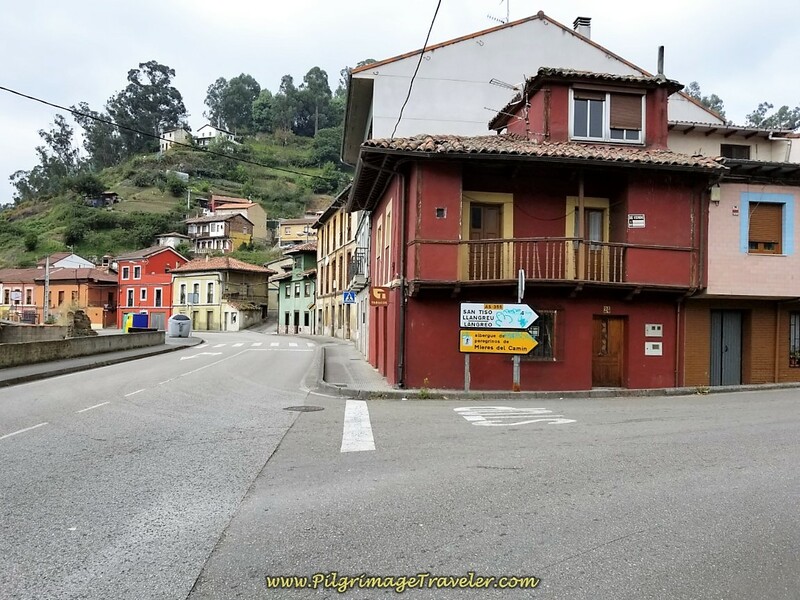 The typical Asturian houses surrounding the square are cider houses. 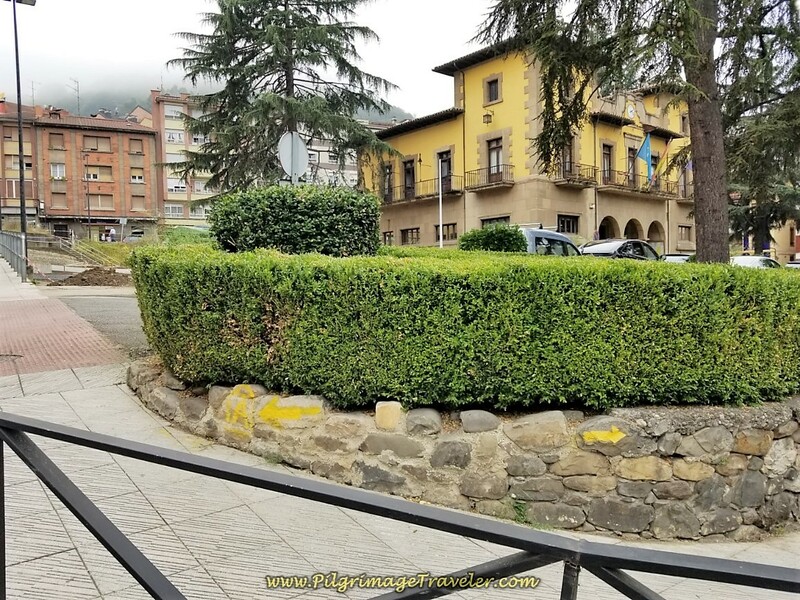 If you are unfamiliar with the Asturian cider tradition, and the famous pouring maneuver, see my Oviedo article where I describe it fully! It is something you must try! Plan a stop here to witness the event, as the albergue ahead doesn't open until 5:00 p.m. anyway! We read the yellow information board by the statue and considered trying to get some food here, but thought we needed a real meal, so decided against it. Unbeknownst to us, we passed by several cafés as we walked north and out of town. 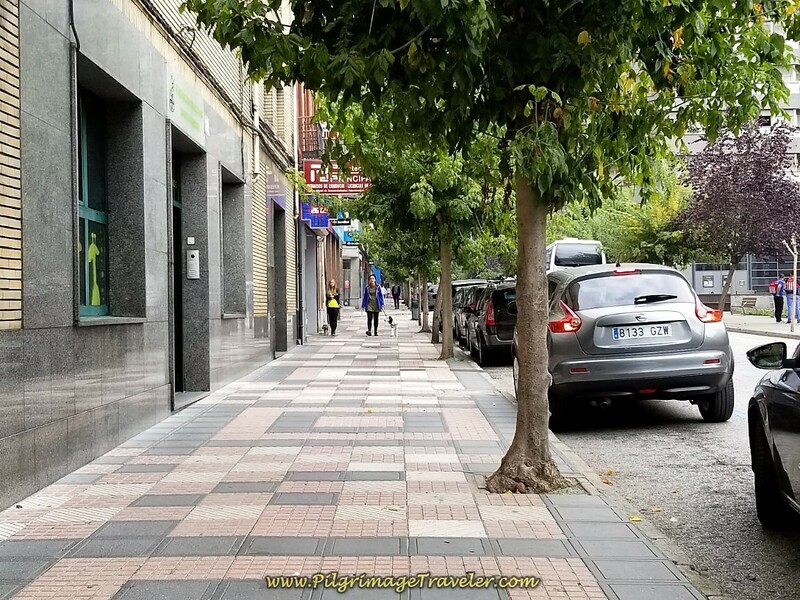 In one half kilometer, after the cider square, walk by the Hotel Mieres del Camino. It is a triangular-shaped building on a corner by a large intersection. Another option for the night. 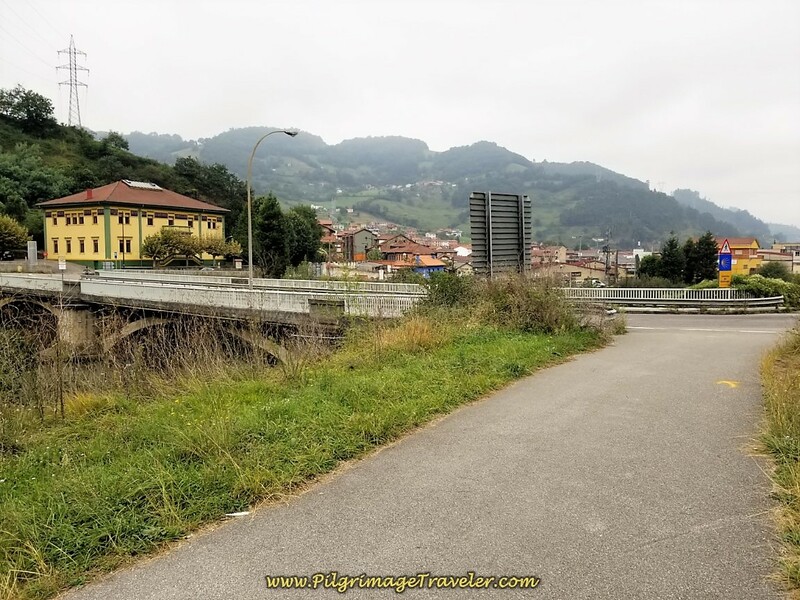 Next, we passed by the leaving Mieres de Camino sign, shown below. 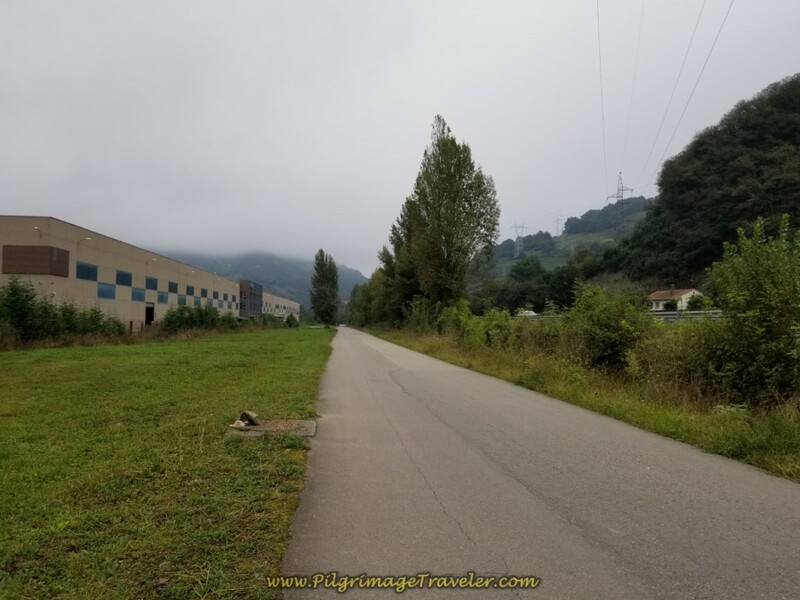 When I was planning this day five on the Camino del Salvador, I didn't realize that the municipal albergue was not in the town of Mieres itself, but several kilometers onward. Since my knee was giving me trouble all day, I was a bit discouraged when I realized this. Had I known, we may have taken the option to stay in the Hostal Pachín in town. But instead, we carried on. 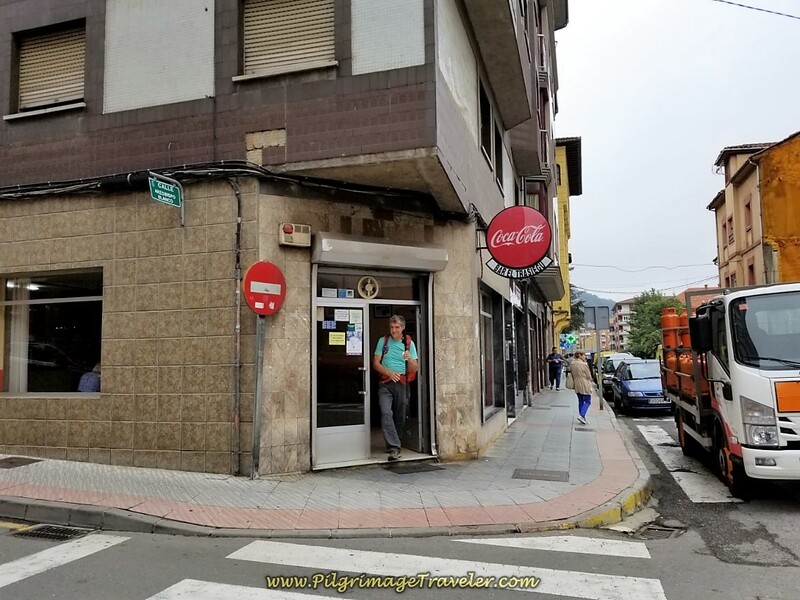 Just beyond the Mieres city limits, we walked by this place, the Bar Nardo, shown in the photo below. We were still very hungry. We looked at each other, knowing that we were soon at the albergue and not knowing what was ahead, we made the decision to stop. What a wise choice it turned out to be! Here we had the menú del día for only 7.50 Euros. It was a fabulous multi-course meal for a fantastic price. I would highly recommend it. After our hearty meal we walked under the overpass of the AS-1 and arrived in the town of La Peña. 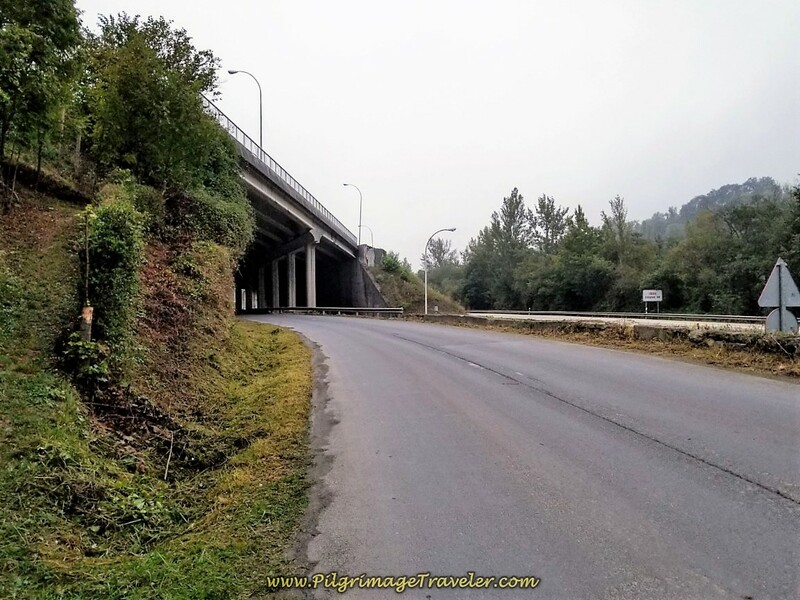 When you see this overpass, you know you are very, very close to the albergue. 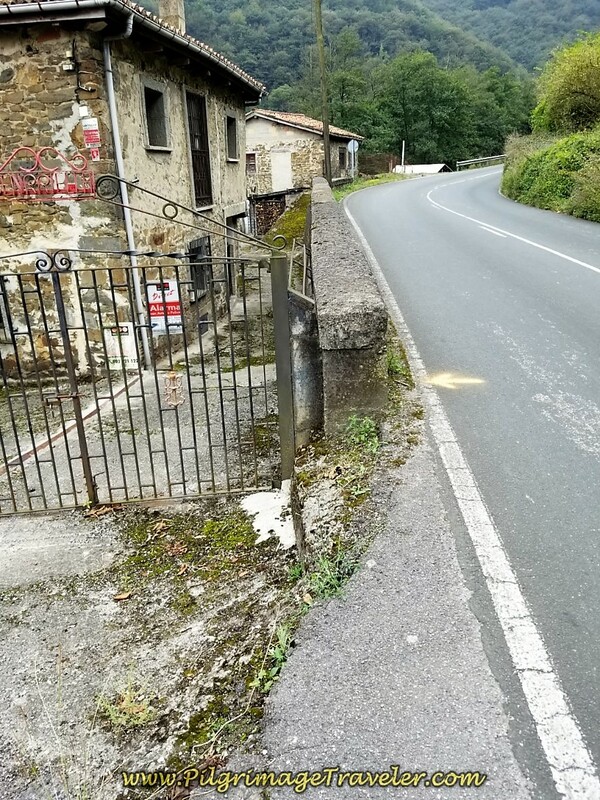 In only a few meters more, you see the bright yellow sign, directing you to turn right towards the albergue. There is also the Hostal and Bar La Peña (+34 985 46 67 15) just beyond this turn along the AS-242. See the Google map above. This is an important place to note, as its café is open 24 hours! A pilgrim's dream. 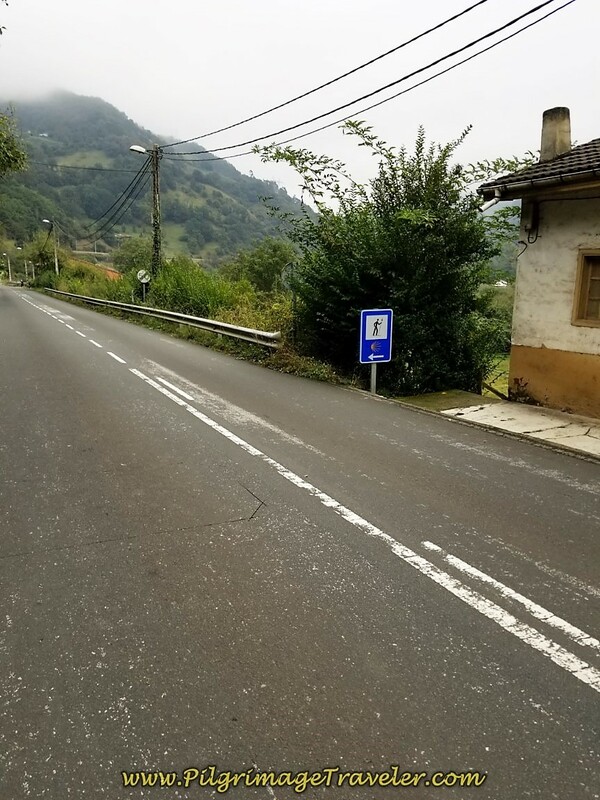 After turning right, in only a few meters more, see the next bright yellow sign for the albergue, shown in the photo below. The albergue is in the ride side of the photo, at the end of the parking lot. When we called the number for the albergue (985 463 266 OR 665 523 426), a woman answered, but it was a man who attended to our registration. You have to wait until 5:00 pm for it to be open, so you may as well have a nice, long and lingering lunch. 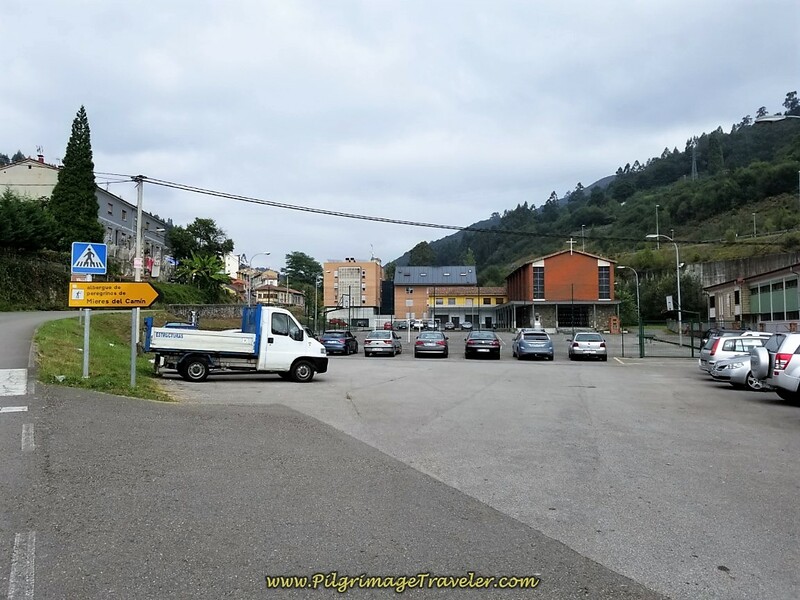 The Albergue de Peregrinos de Mieres was clean, with clean blankets and was actually quite nice, for only six euros each. It has a bad reputation, but this certainly was not our experience when we stayed here. Please note that the phone numbers listed in the link are different than the numbers I have listed above. Contacting the hospitalero/a was all very confusing to me, but I used one of the numbers in the parenthesis above. We were the first to arrive and had to wait a long time for the hospitalero to show up. There is no kitchen to speak of at the albergue, so plan on a cold supper from your pack, or the Bar La Peña. Be forewarned, that while the café is open for 24 hours, they do not serve dinner here until 9:00 p.m! Rich and I did wait around for dinner, despite our large lunch. Rich was still hungry and did not want just a snack from our packs, so we joined our Spanish compadres at the bar. It made for a late night, but the next day's journey was a short one, so we didn't care. As I stated above, this day was not my favorite. My left knee was giving me woes, the many long stretches on the pavement were quite boring and difficult for my knee and the sound of the traffic from the highway we followed all day was not pleasant. However, if you want to get to Oviedo, you must put your head down and just do it! While I did very little complaining, my heart did not want to complete this day. I just wasn't feeling it! My spiritual training of accepting and including all that comes my way did not work well for me. I did not want to accept nor include. And so it is and was. For most of the day, I just wanted it to be over. Where was my "symbol and image of an active life?" I couldn't help wondering what I was doing to myself. I did not want to create a more permanent situation with my knee. Yet I carried on because my brain believed that it was all just a repetitive motion problem that would go away. I had merely pushed myself too hard and walked too far the prior day. Time would tell, wouldn't it? 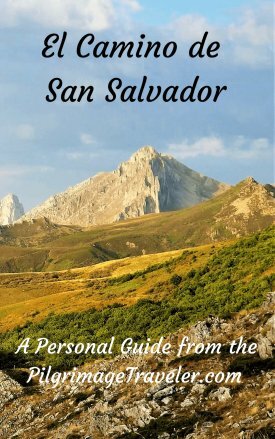 May your own day five on the Camino de San Salvador be a wonderful road, as the novelist George Sand reminds us: It is the symbol and the image of an active and varied life. 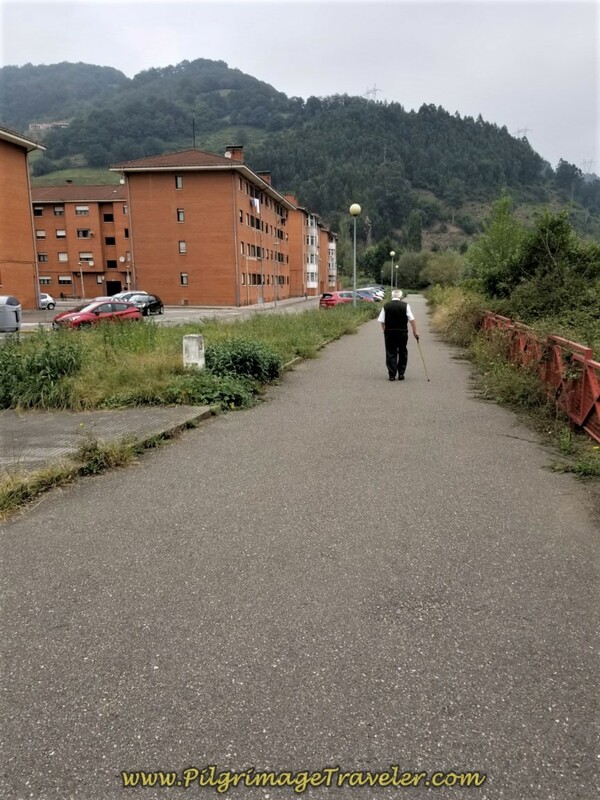 May you feel this road, and may it be beautiful for you as you walk to Oviedo! Ultreia!